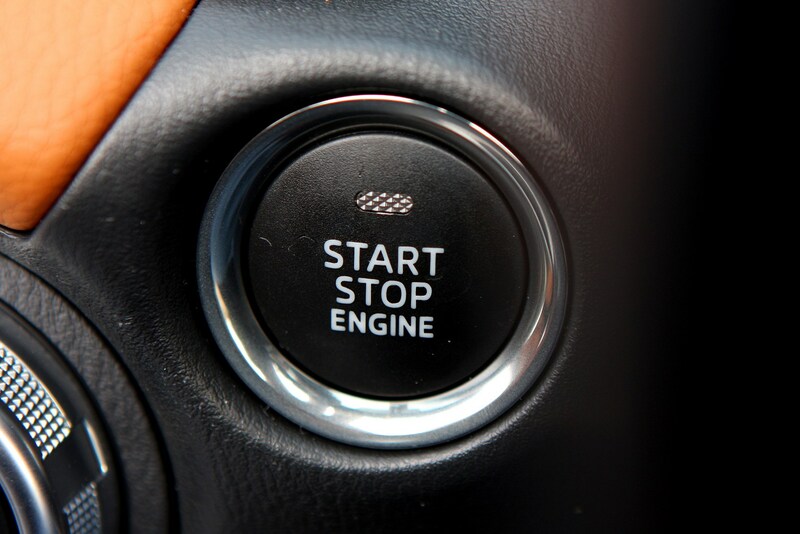 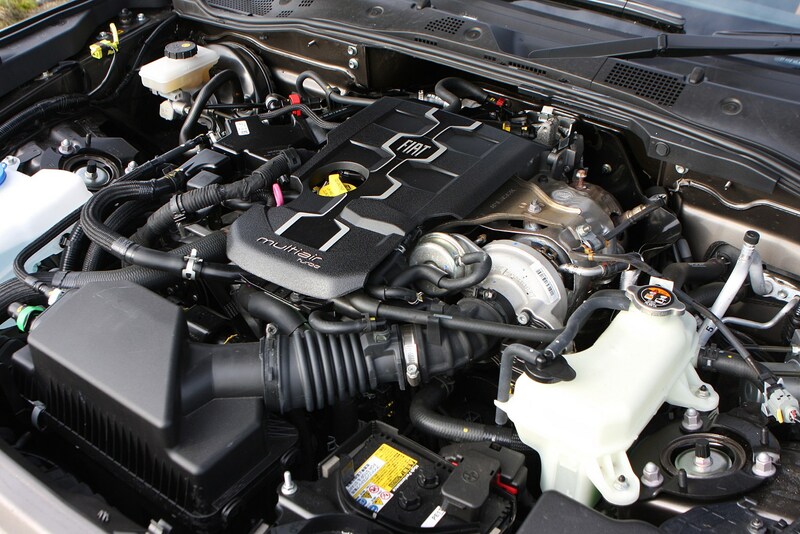 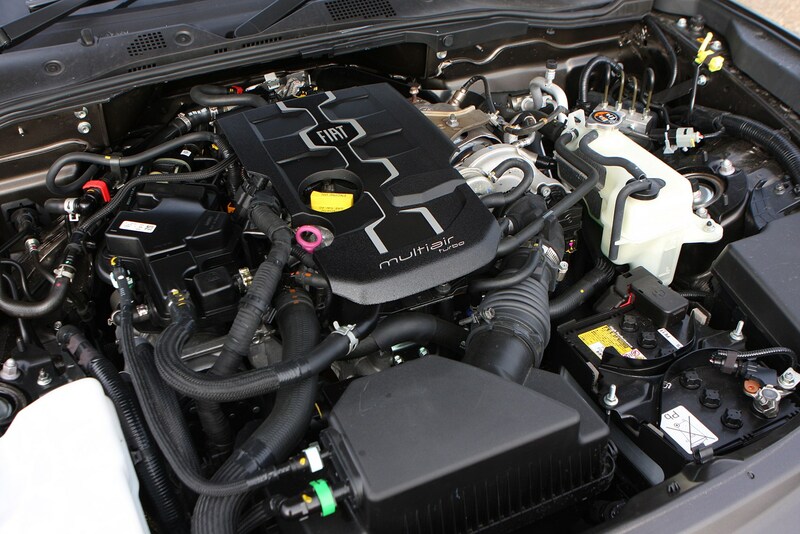 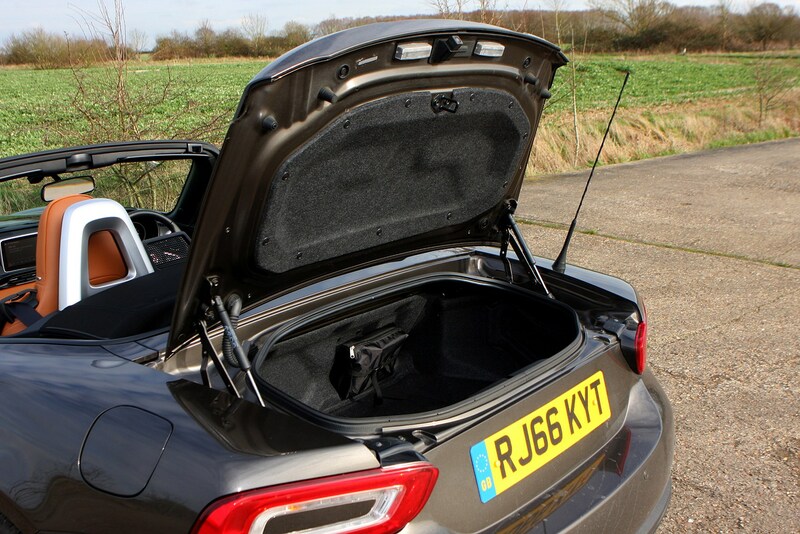 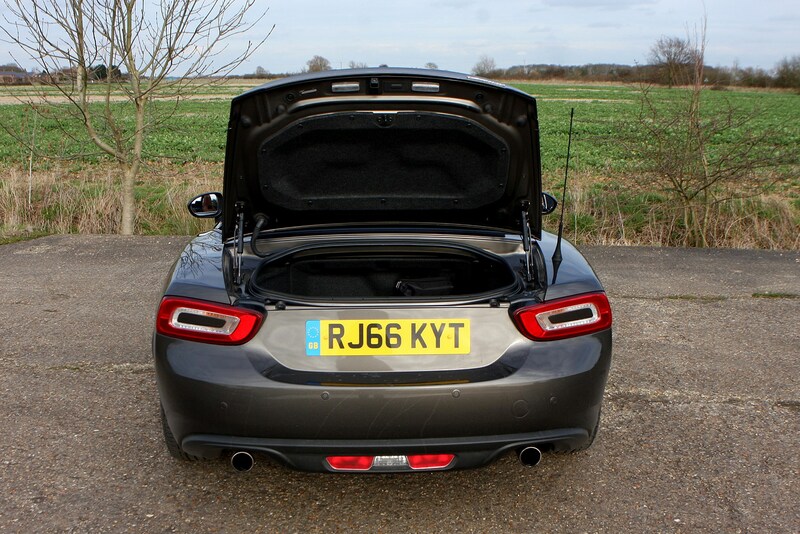 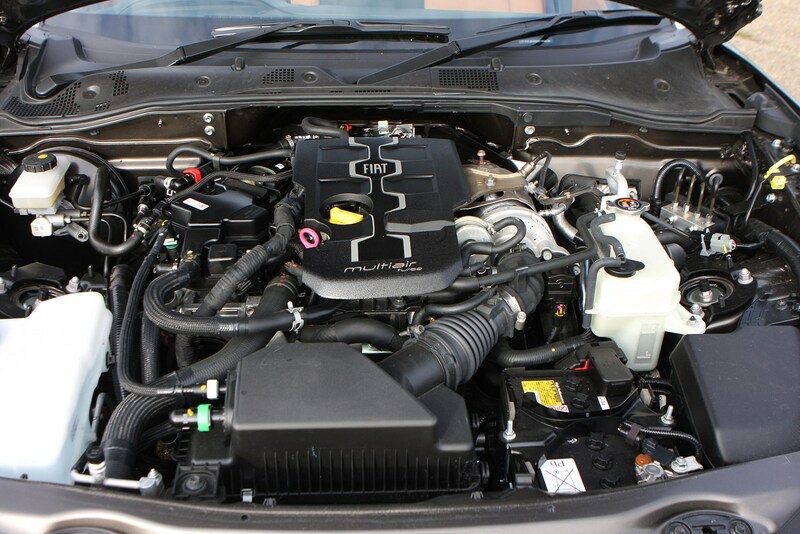 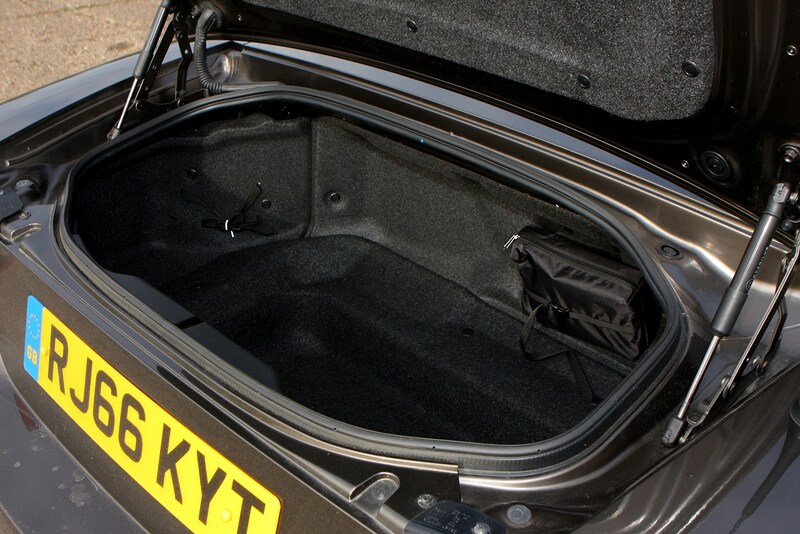 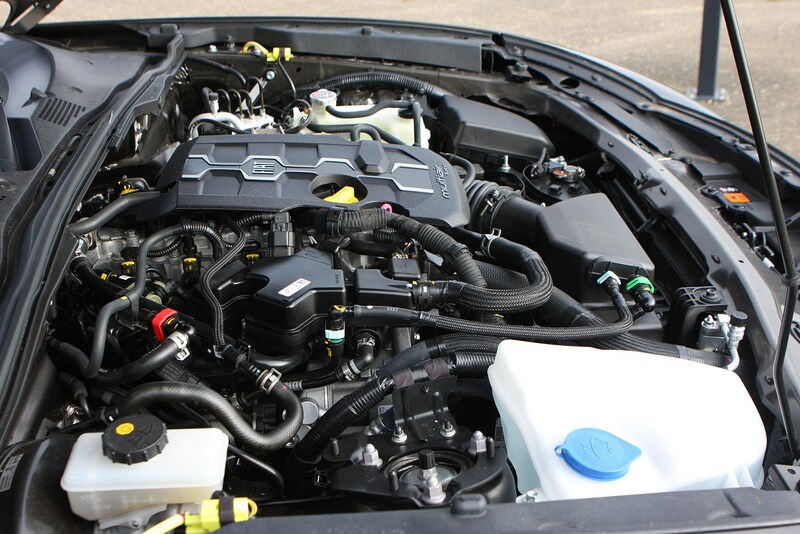 There’s only one choice of engine in the standard car, unlike the Mazda MX-5, which offers 1.5- and 2.0-litre units. 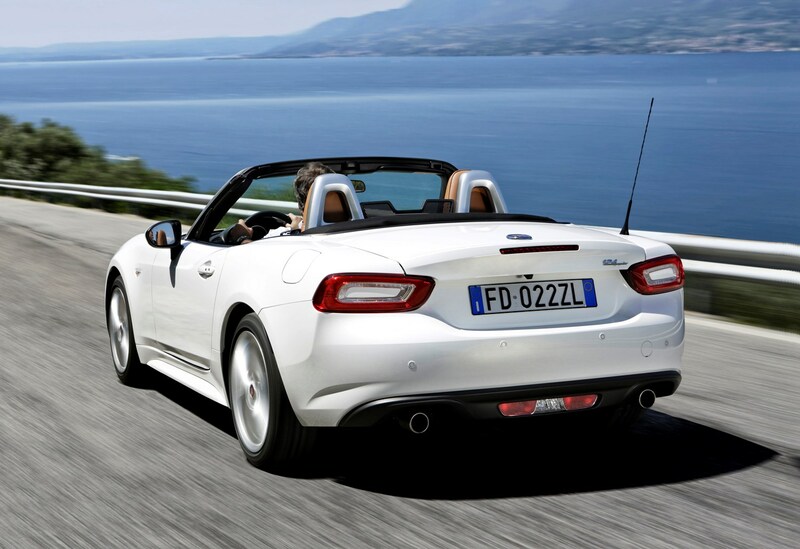 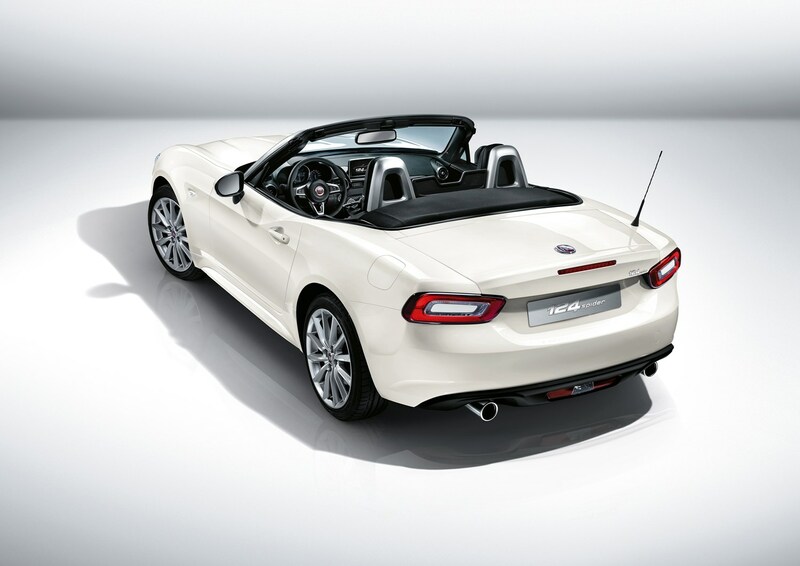 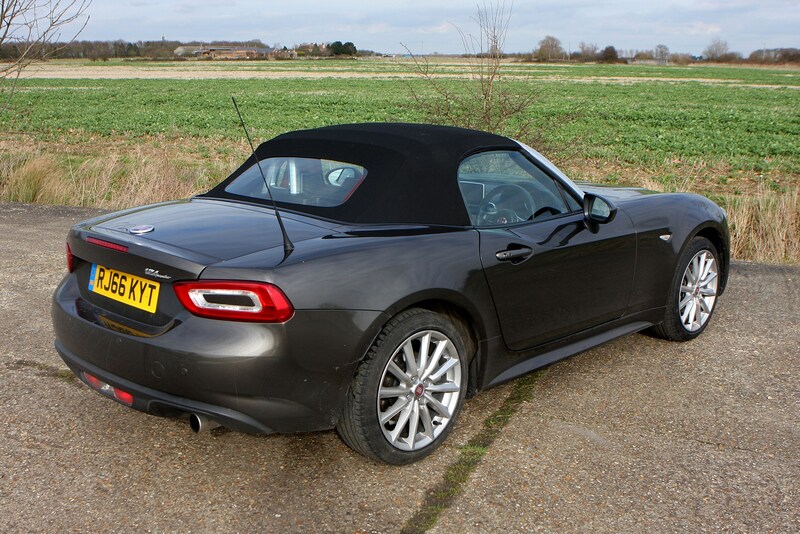 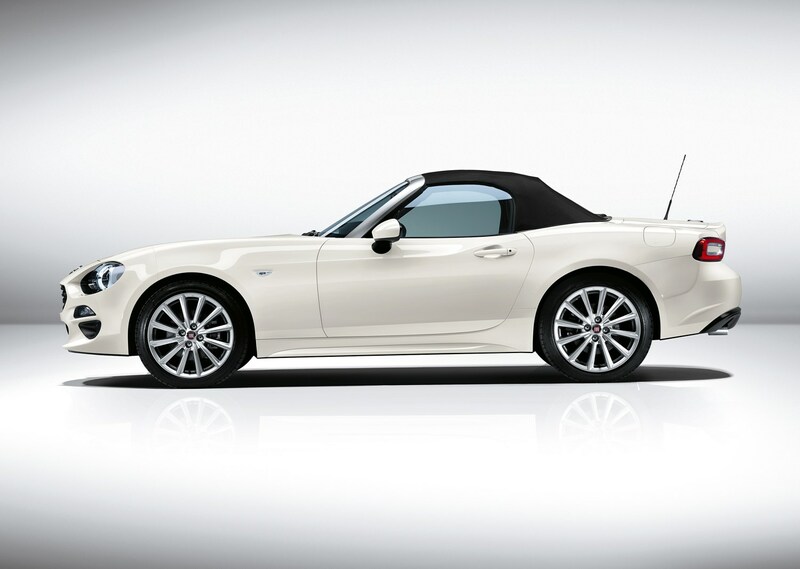 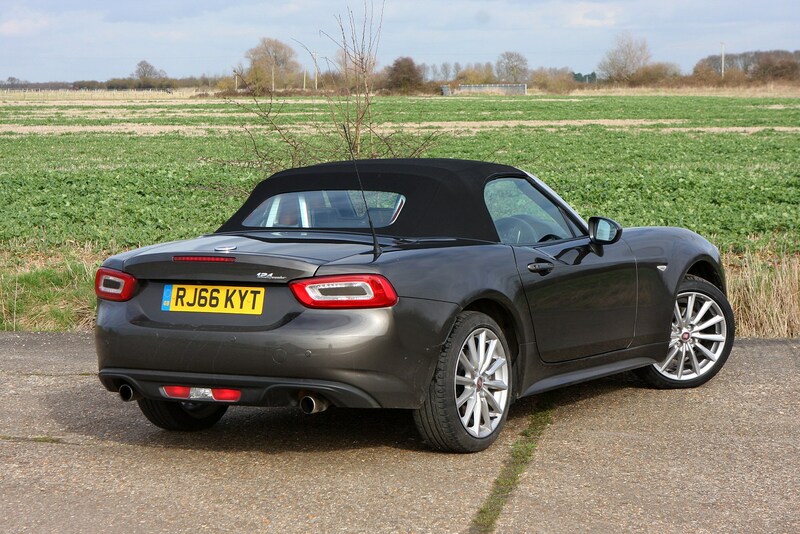 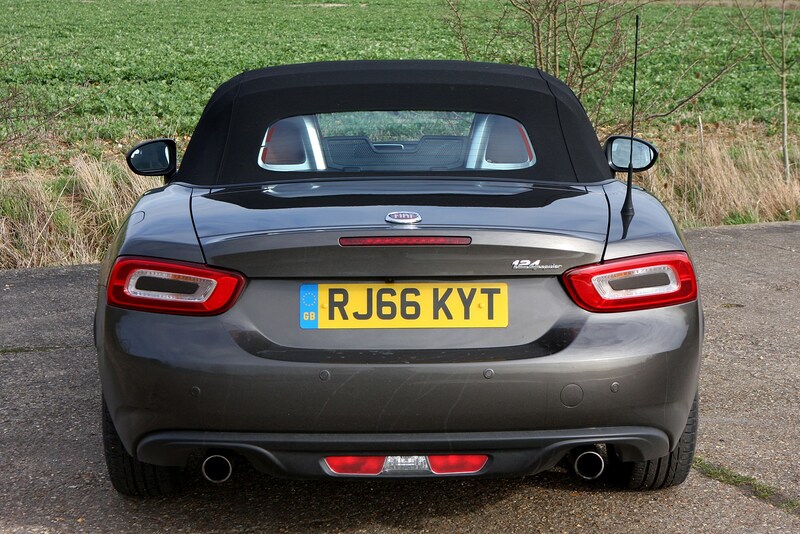 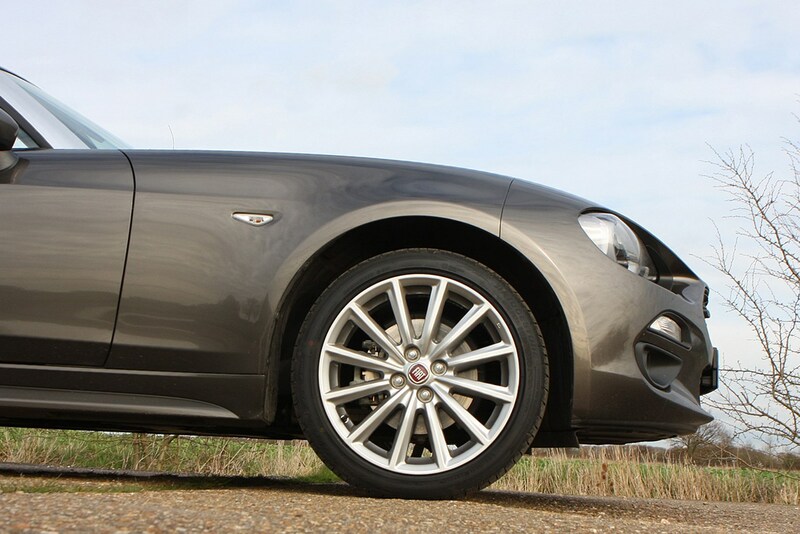 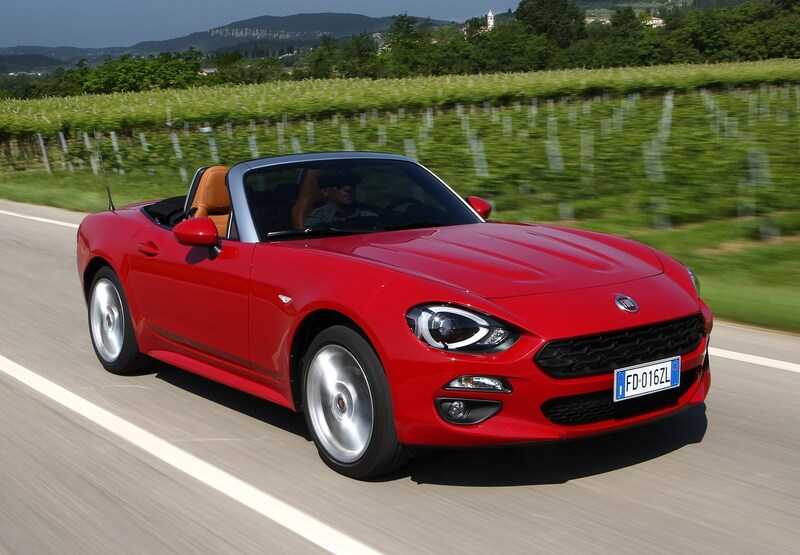 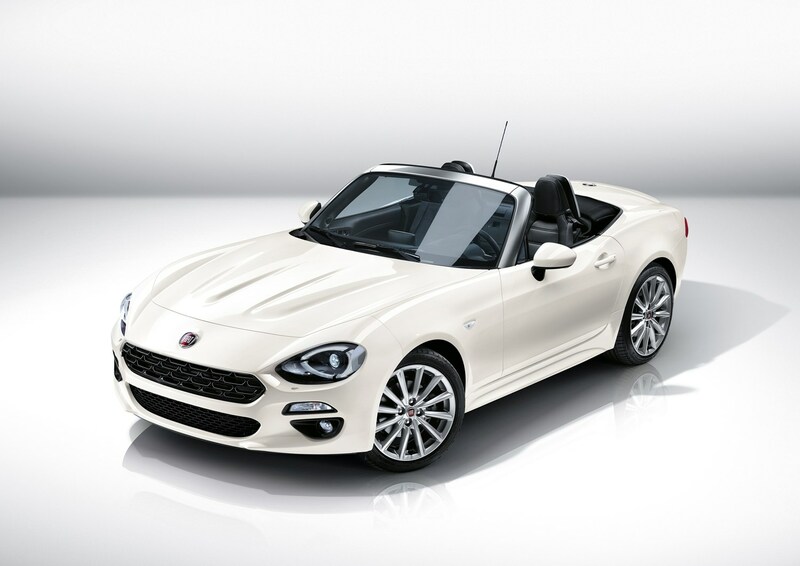 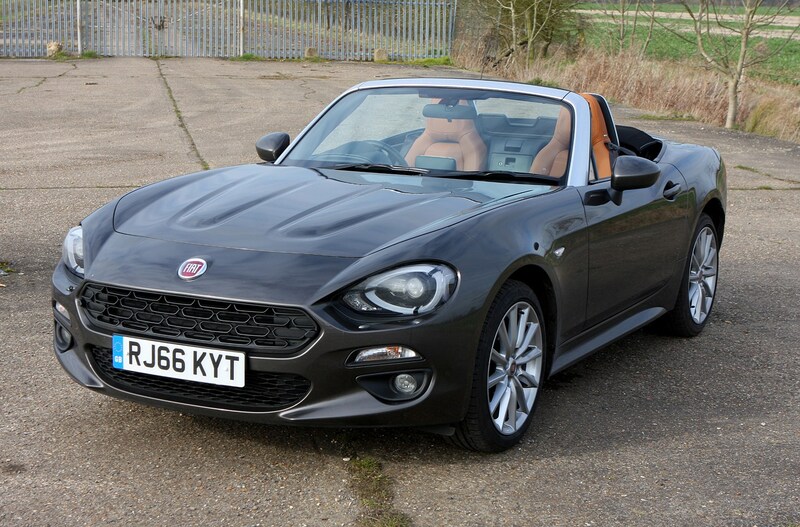 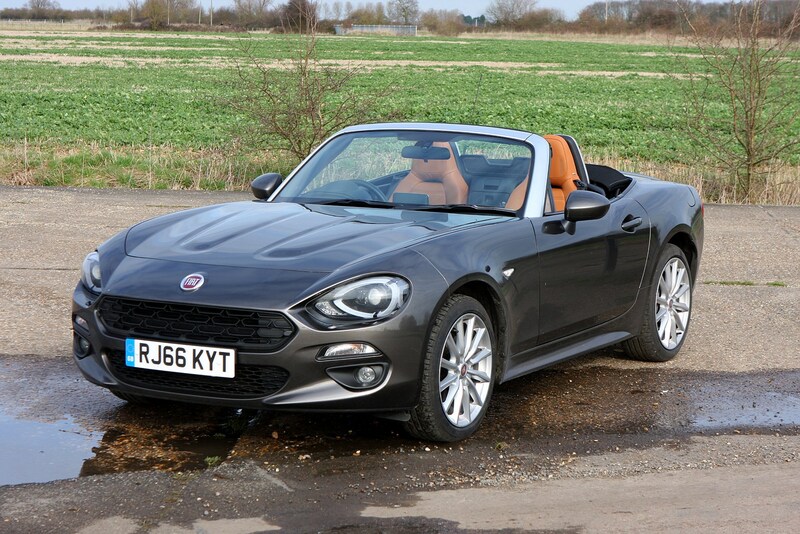 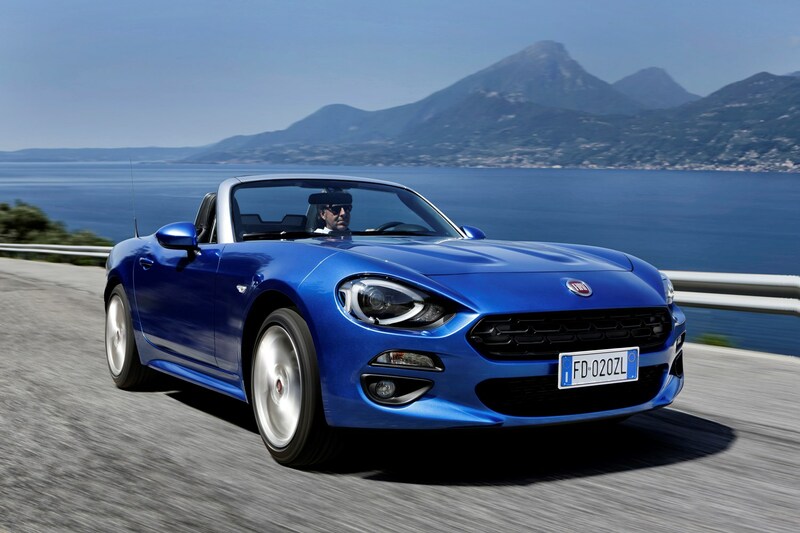 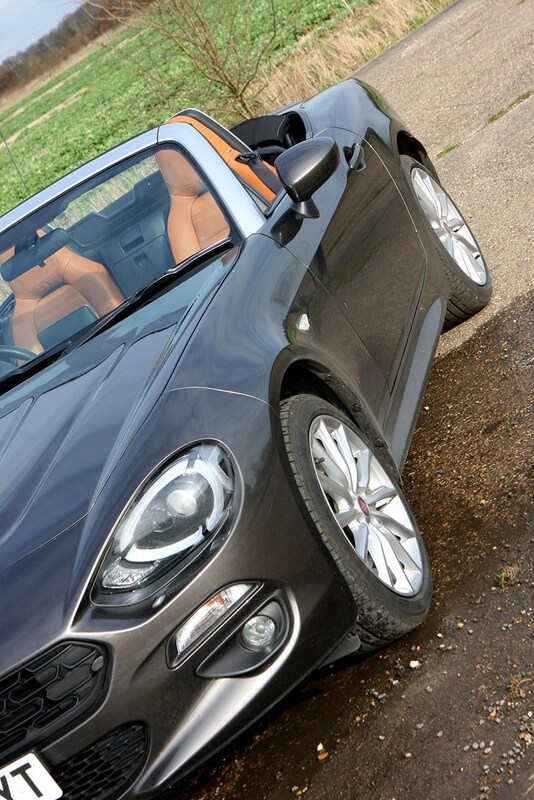 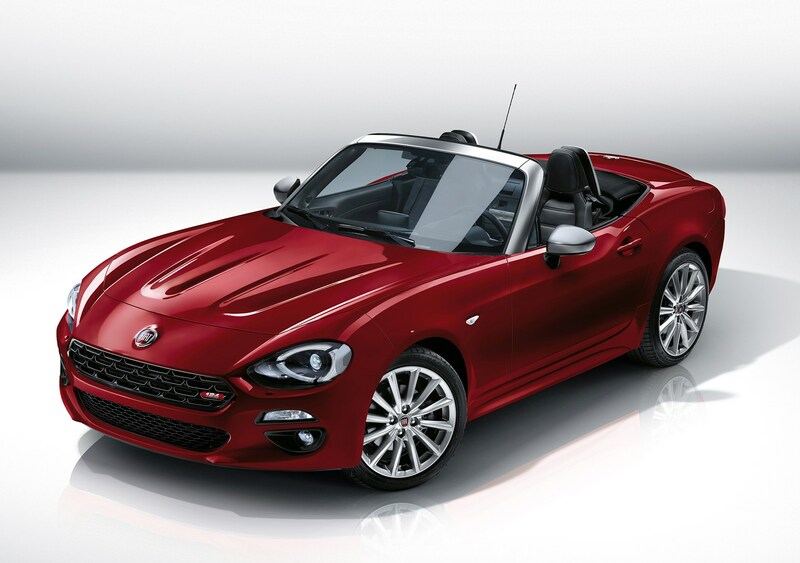 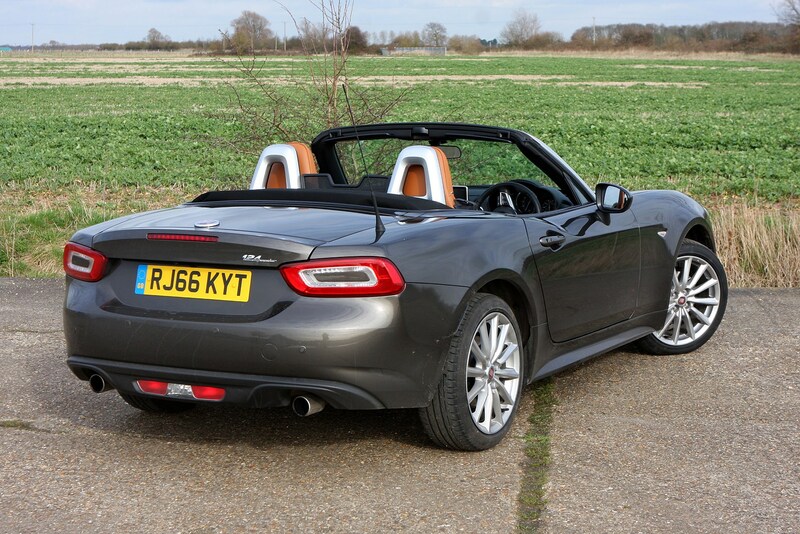 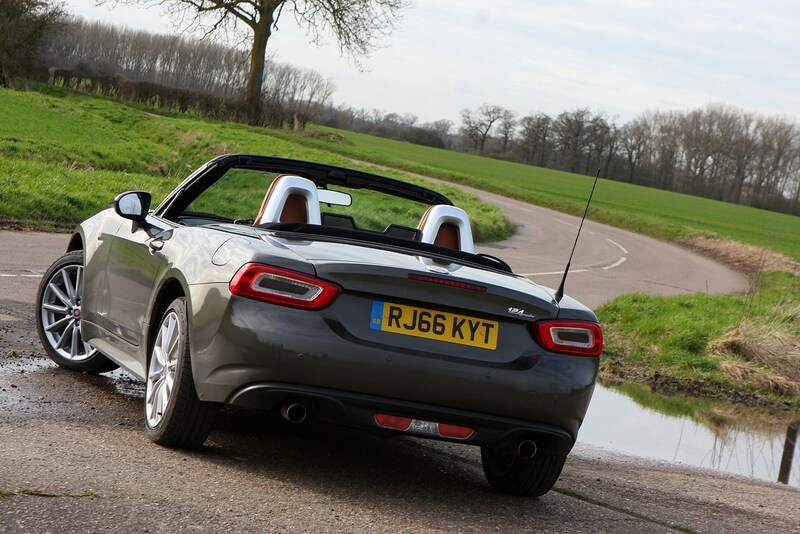 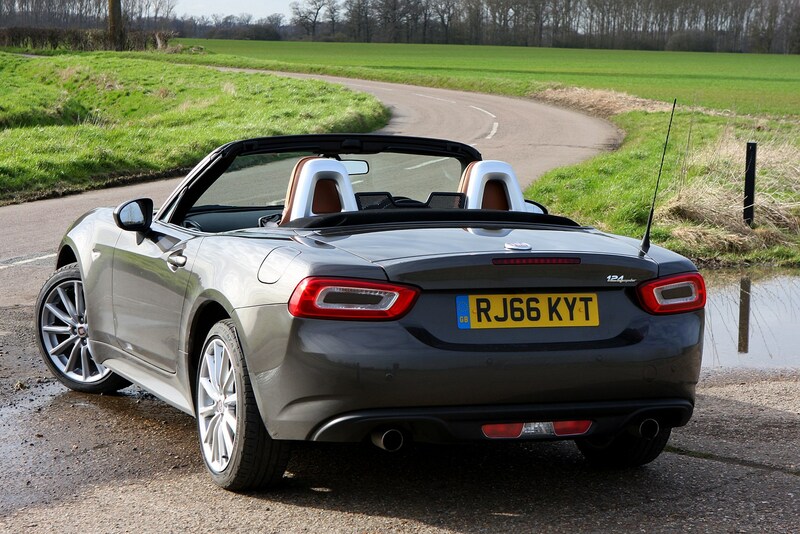 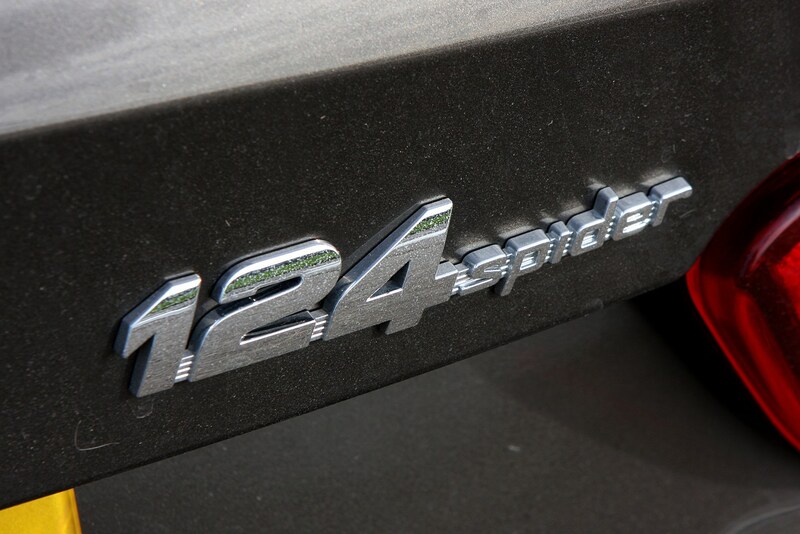 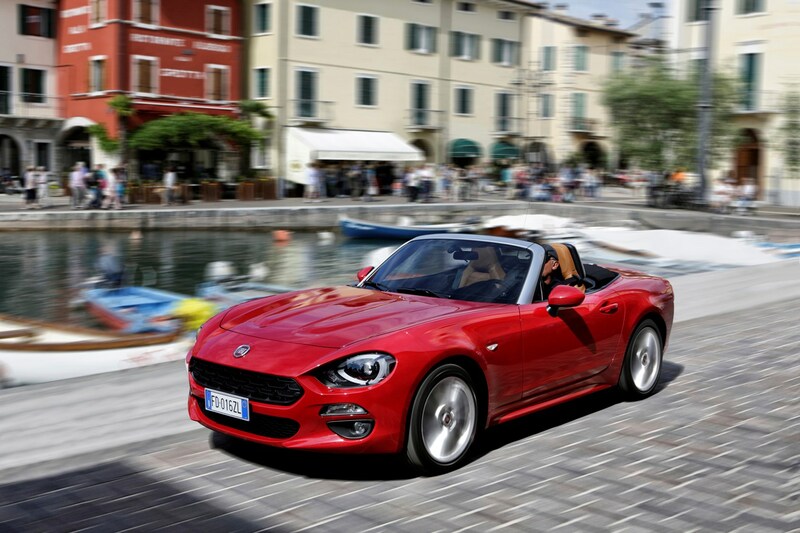 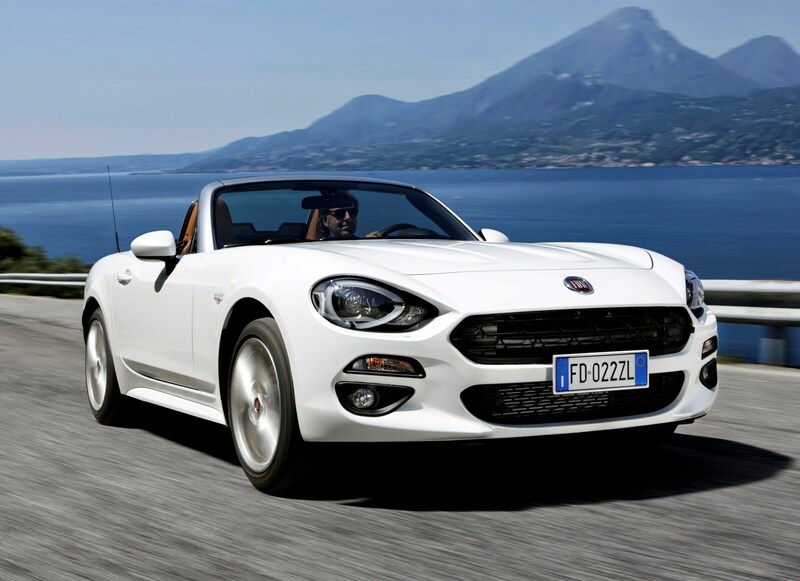 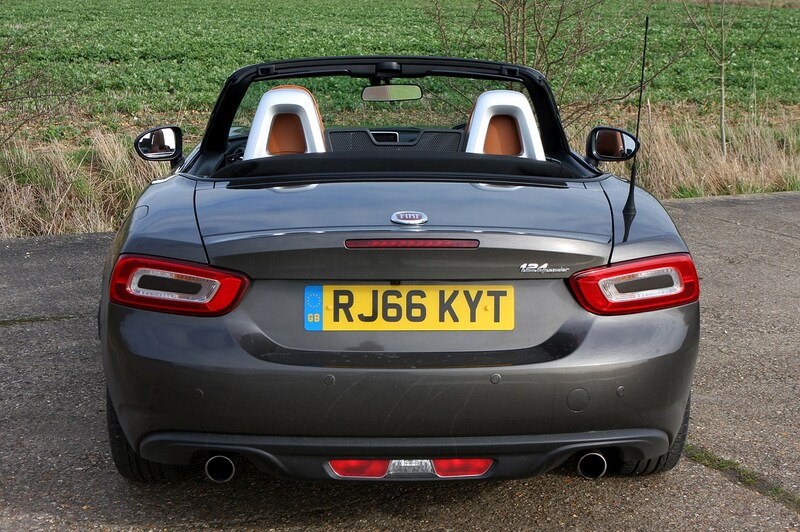 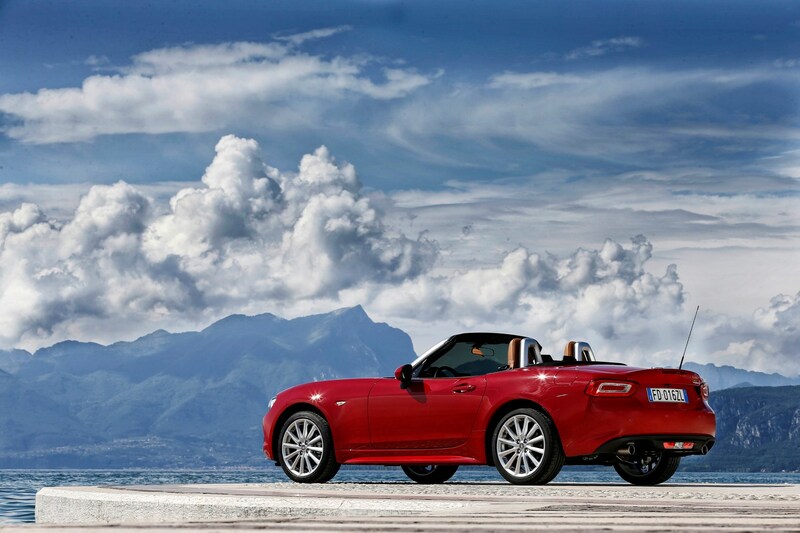 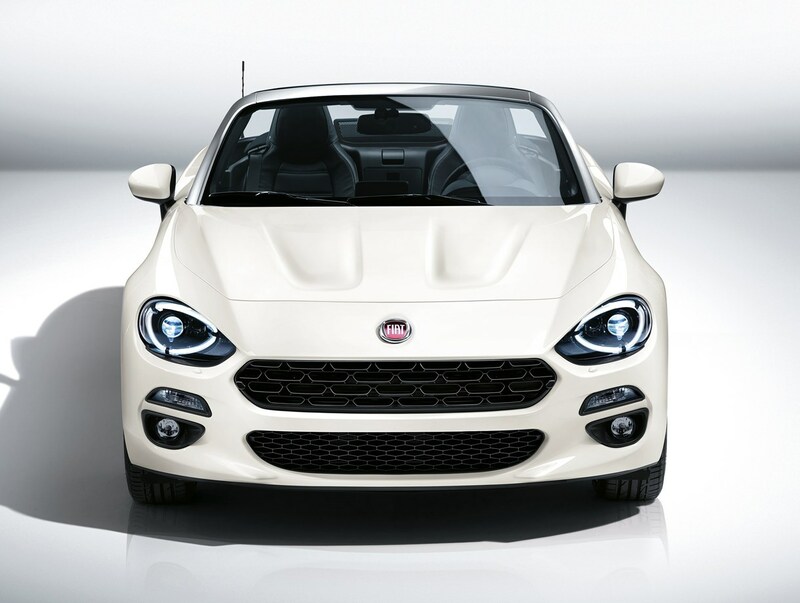 Buy a Fiat 124 Spider and it’ll be powered by a 1.4-litre turbocharged petrol engine, so that’s an easy decision. 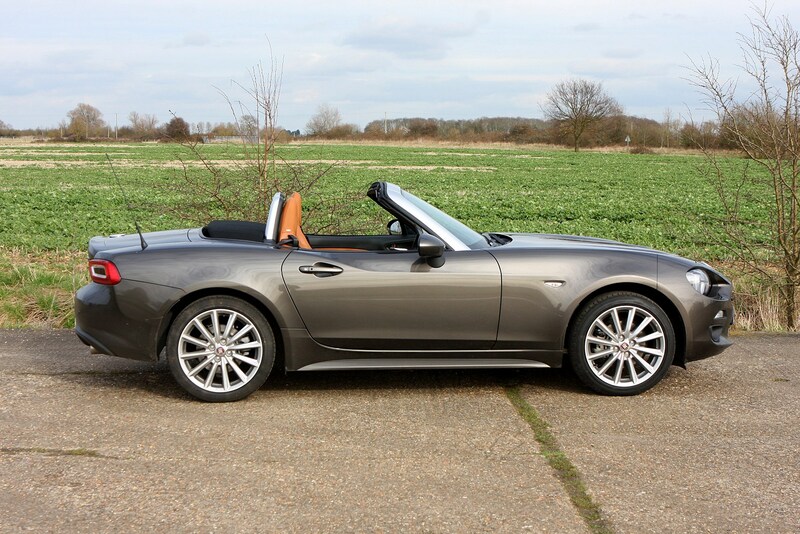 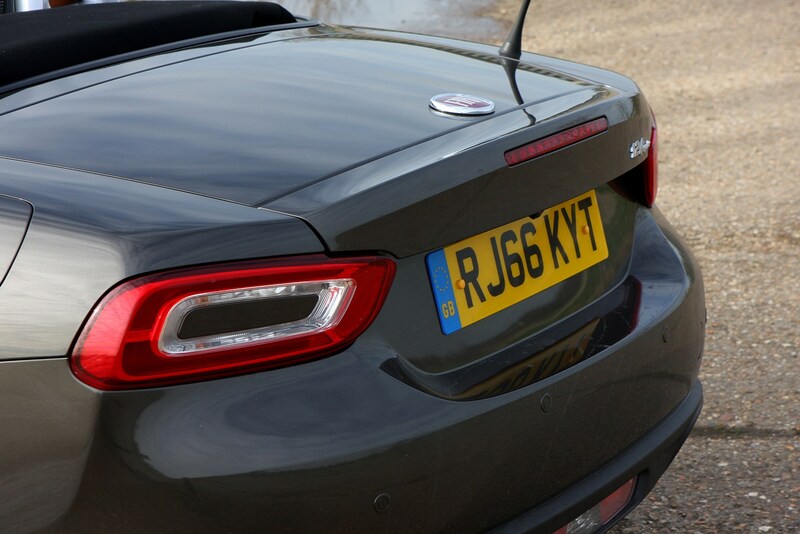 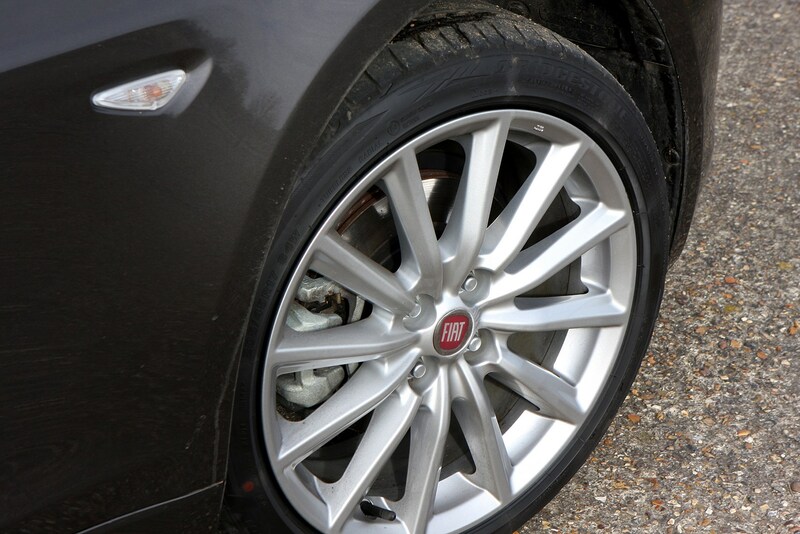 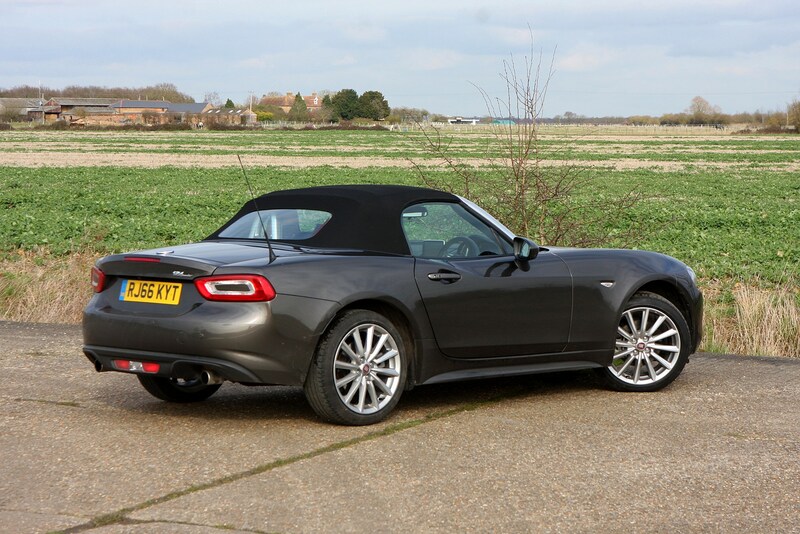 This is perhaps the biggest difference between the Italian car and the Mazda it’s based on – while the MX-5’s powerplants thrive on revs to deliver their power, the Fiat delivers its performance with readily available turbocharged ease. 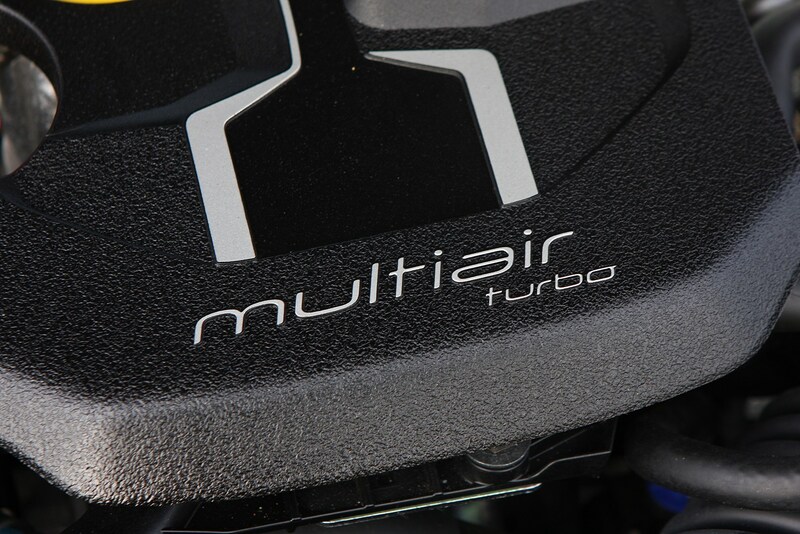 That’s because the motor is boosted by a turbo, delivering 140hp and 240Nm of torque, the latter from a relatively low 2,500rpm. 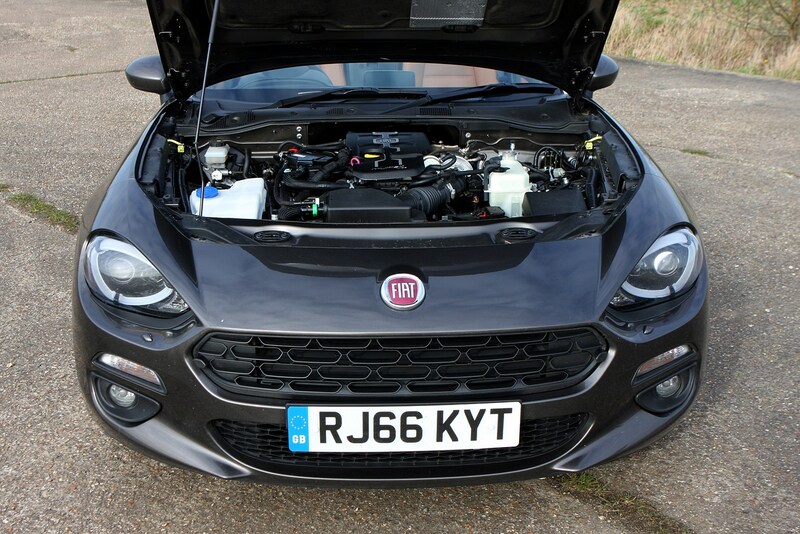 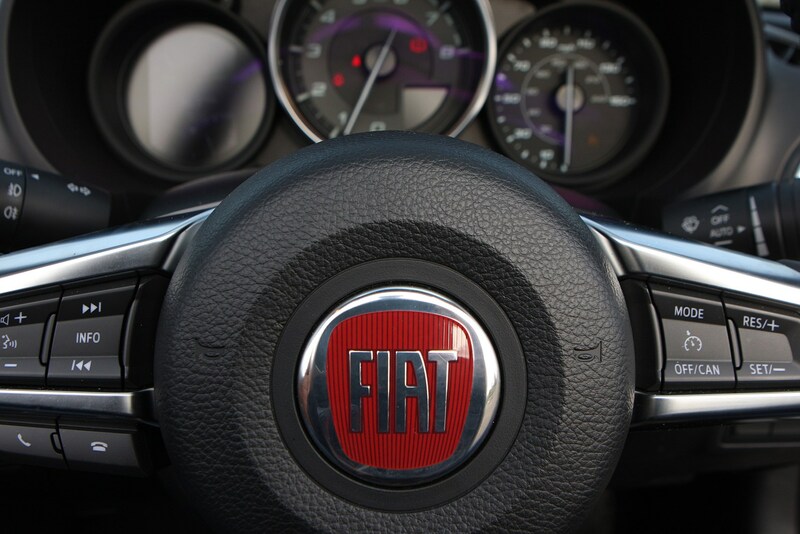 The power doesn’t run out until 6,500rpm either, so there’s plenty of reason to run the Fiat up to its limiter, accompanied by a raspy, metallic exhaust note. 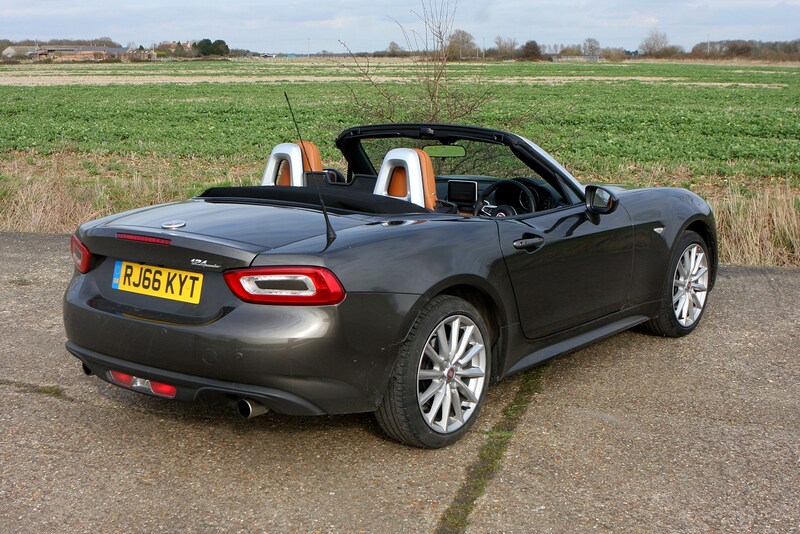 Snick through the fabulous six-speed manual gearbox quick enough and 0-62mph will tumble in 7.5 seconds, which is comparable to the 2.0-litre MX-5, while top speed stretches to 134mph. 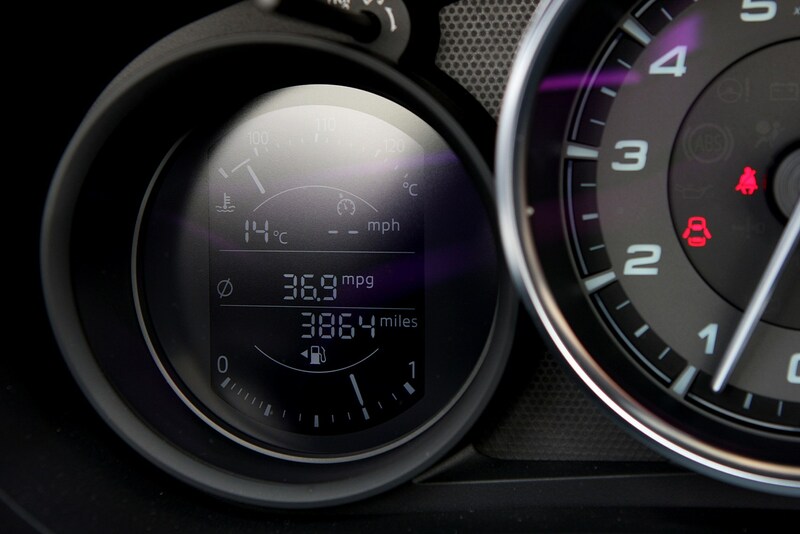 With a smaller engine and turbo you also get respectable economy figures, with the Fiat’s fuel consumption and CO2 figures coming in between the Mazda’s two powerplants. 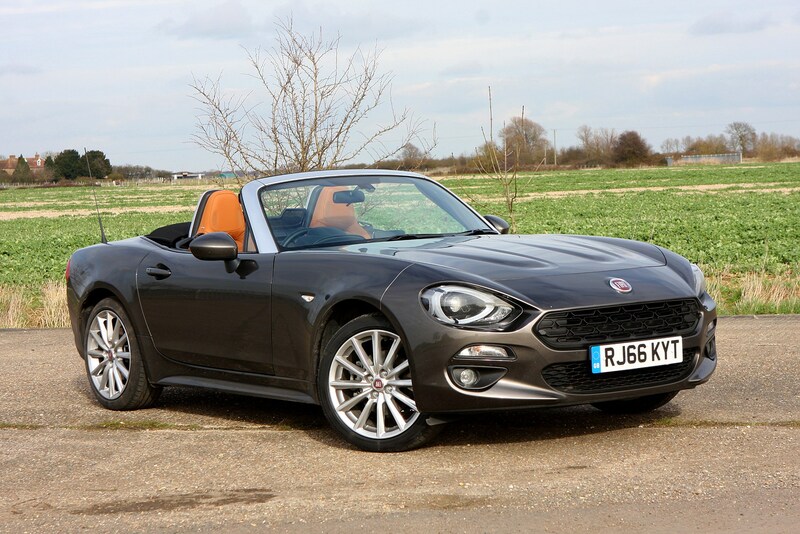 The more performance-oriented Abarth 124 is powered by the same 1.4-litre engine but comes with more power. 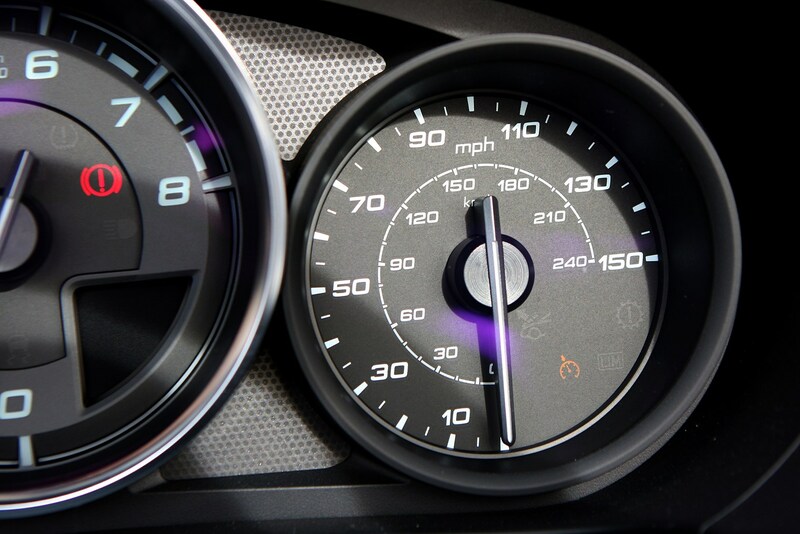 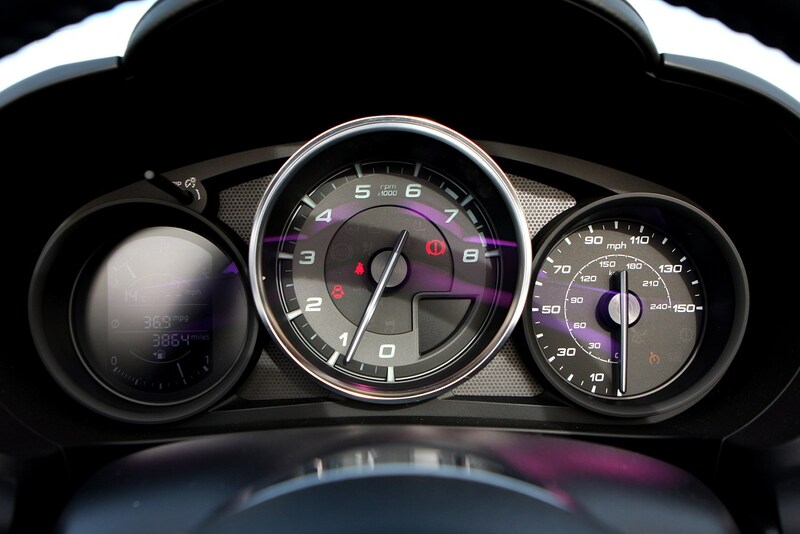 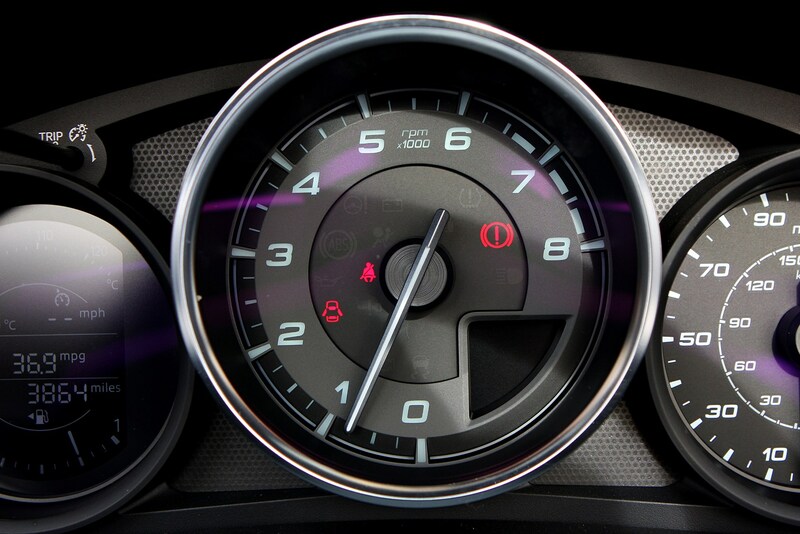 With 170hp and 250Nm, the dash from 0-62mph drops to 6.8 seconds and pushes on to a higher top speed of 143mph. 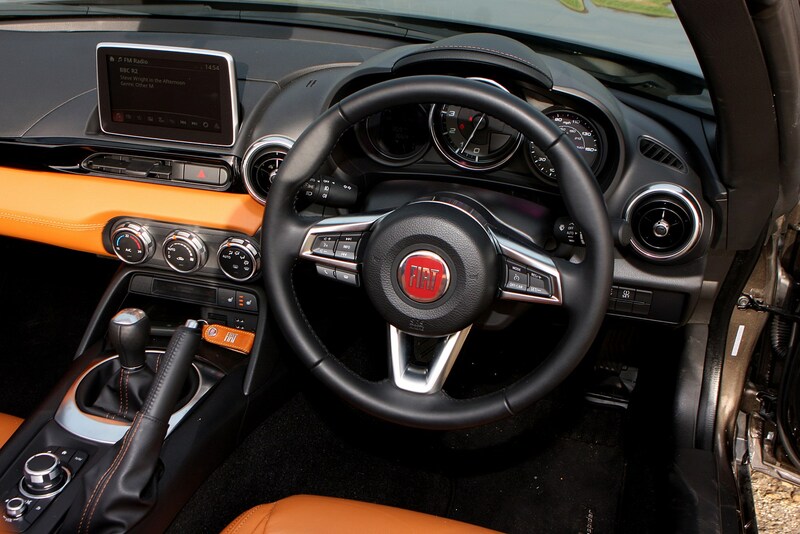 Unlike the Fiat, the Abarth is also the only one available with an automatic gearbox. 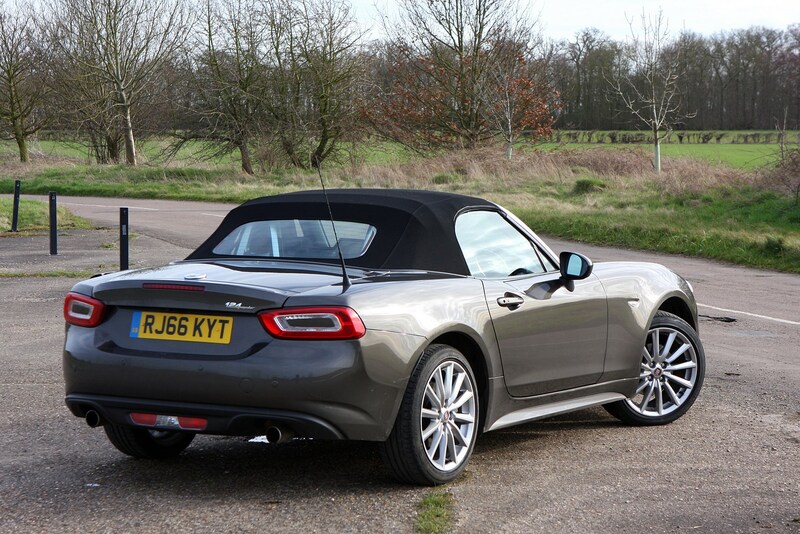 The 124’s suspension has been retuned and feels a bit more compliant here than in the MX-5. 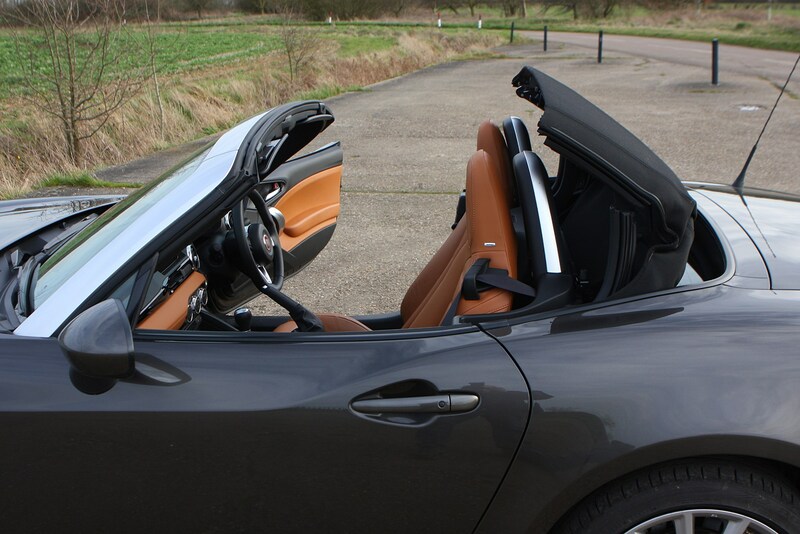 It’s far from being overly soft though, capable of slicing through a series of bends with the same confidence as the Japanese car. 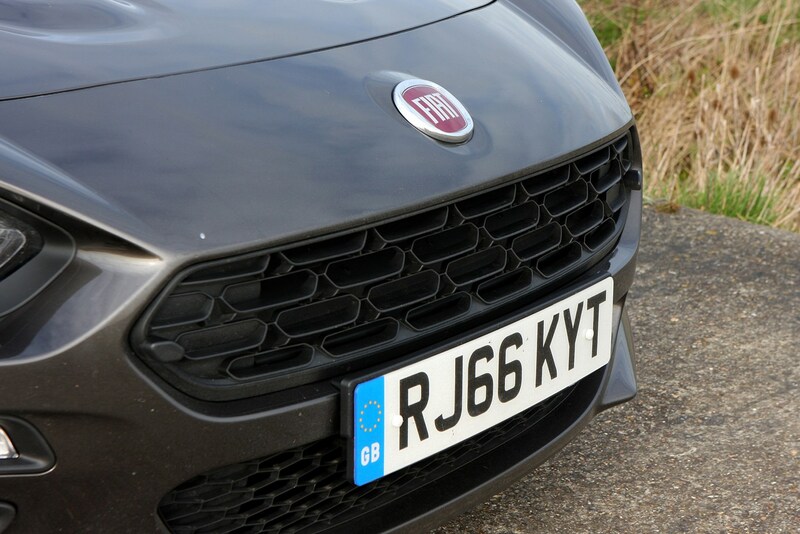 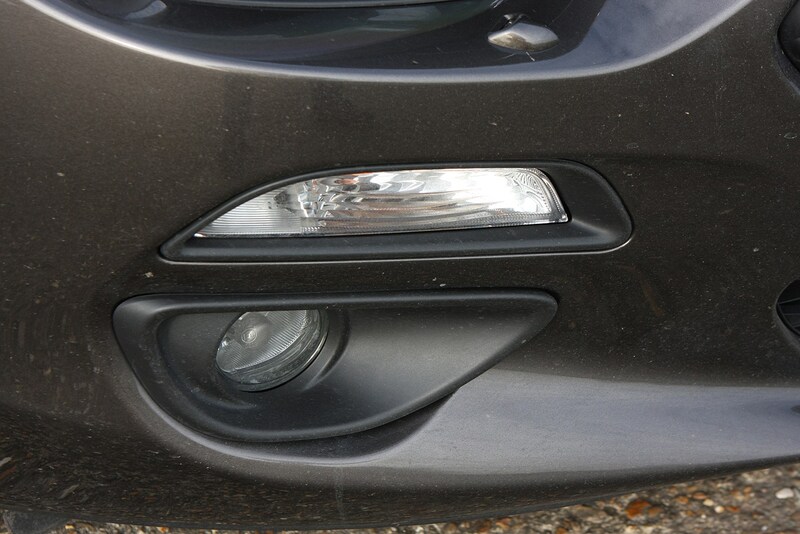 We reckon it’s marginally less precise and therefore the second choice of the two for attacking your favourite B-road. 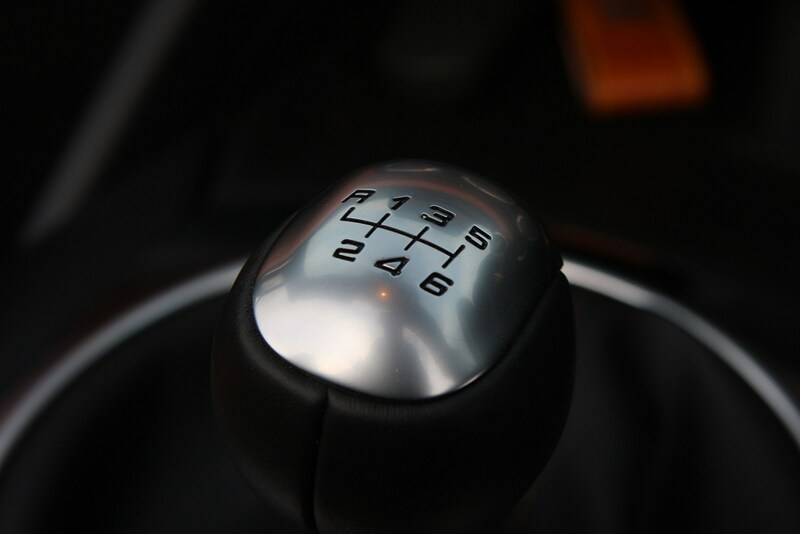 Dial your right foot back a bit and there’s still a lot of fun to be had, it’s just better-suited to a slightly more relaxed approach. 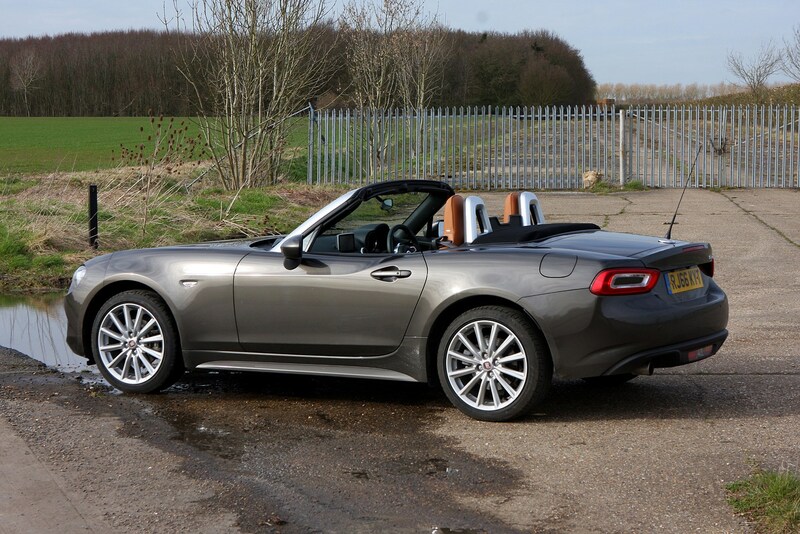 As with the Mazda you can expect wonderfully light but accurate steering, which gives you loads of information about the grip levels of the front tyres. 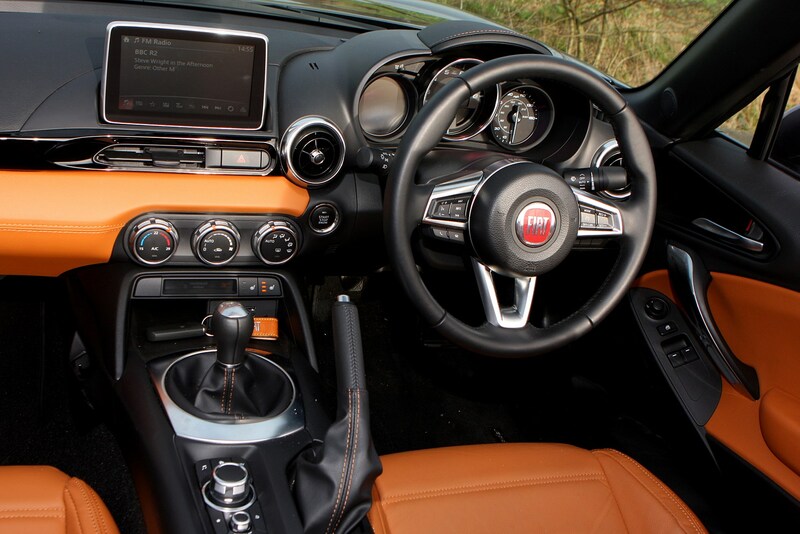 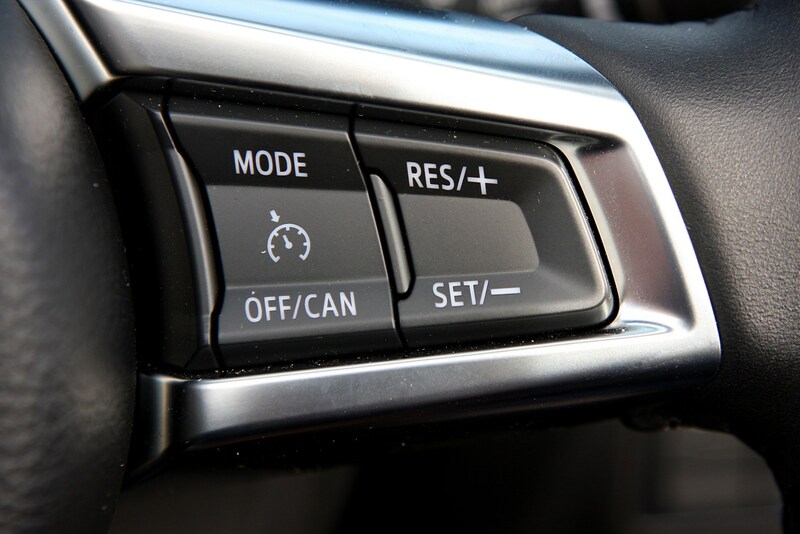 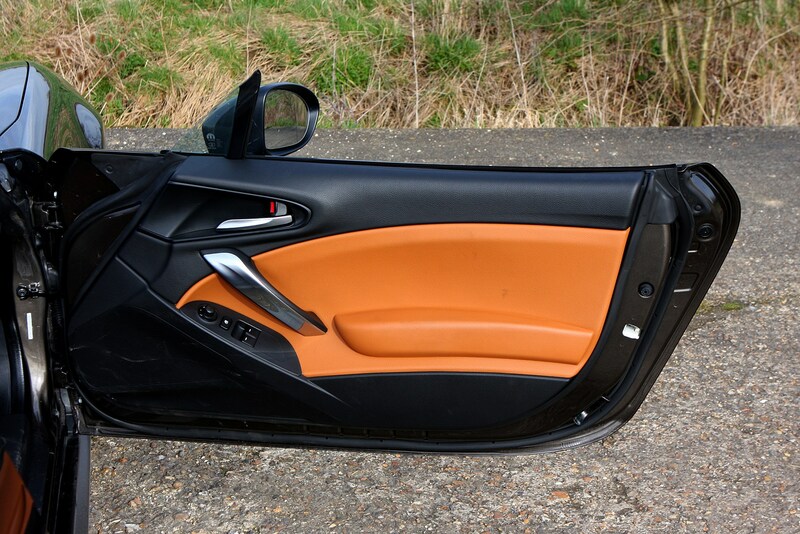 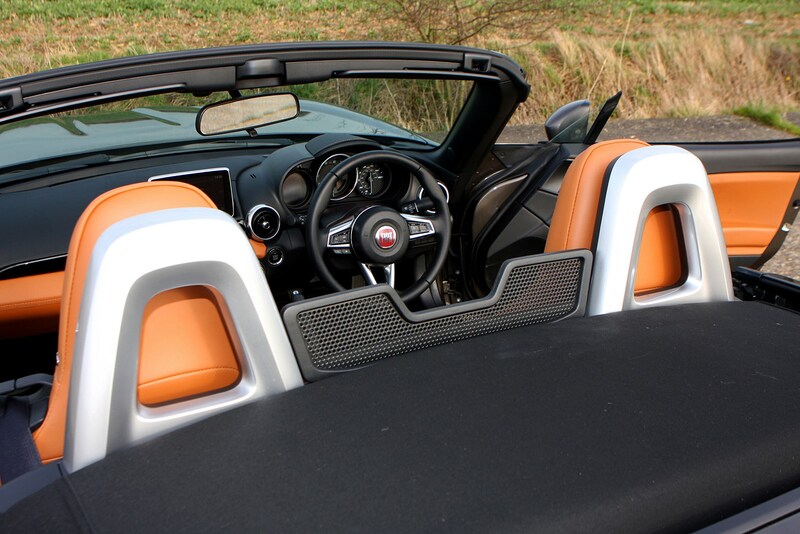 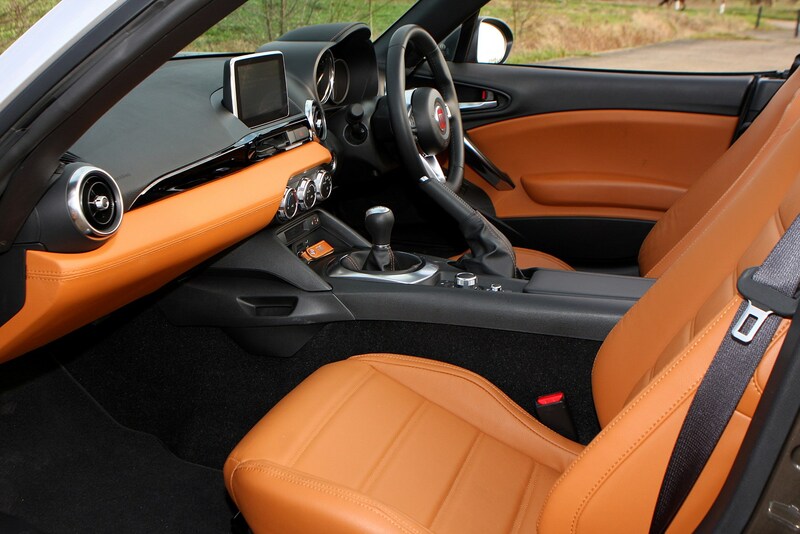 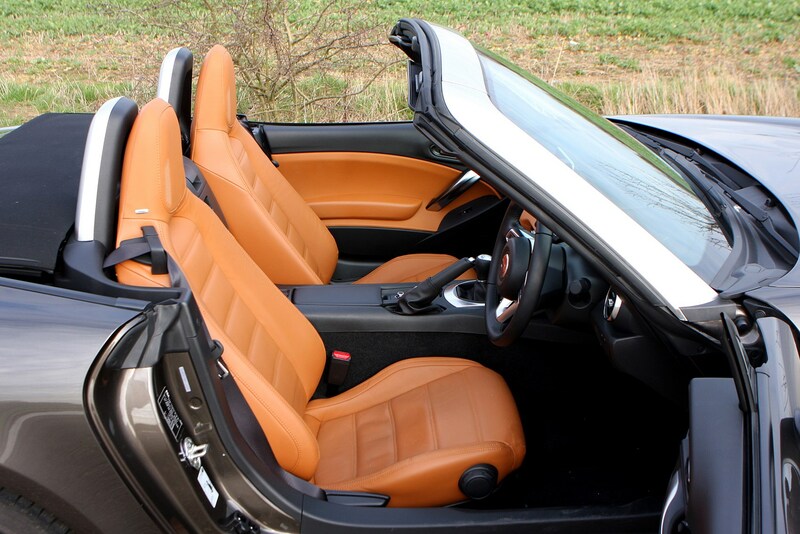 If you’ve driven a Mazda MX-5 then there’s little you won’t recognise in the Fiat – there is a pair of low-slung, supportive yet comfortable seats, a solidly built dashboard and clear, easy-to-read dials. 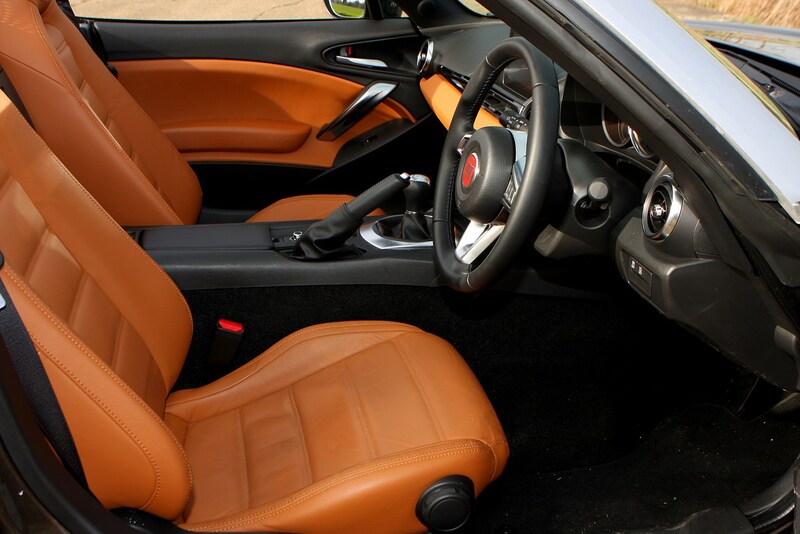 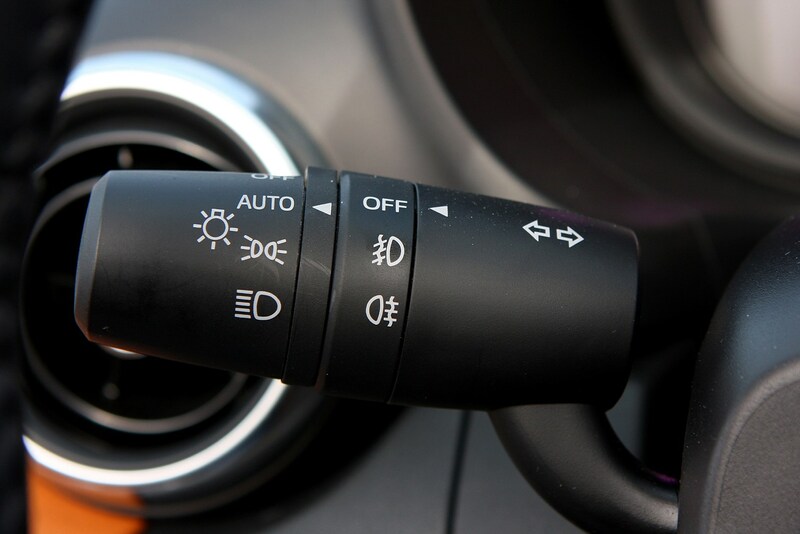 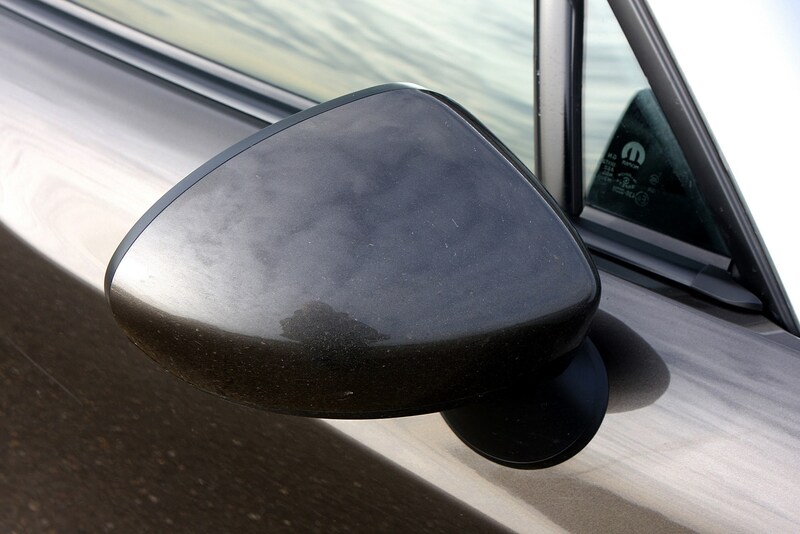 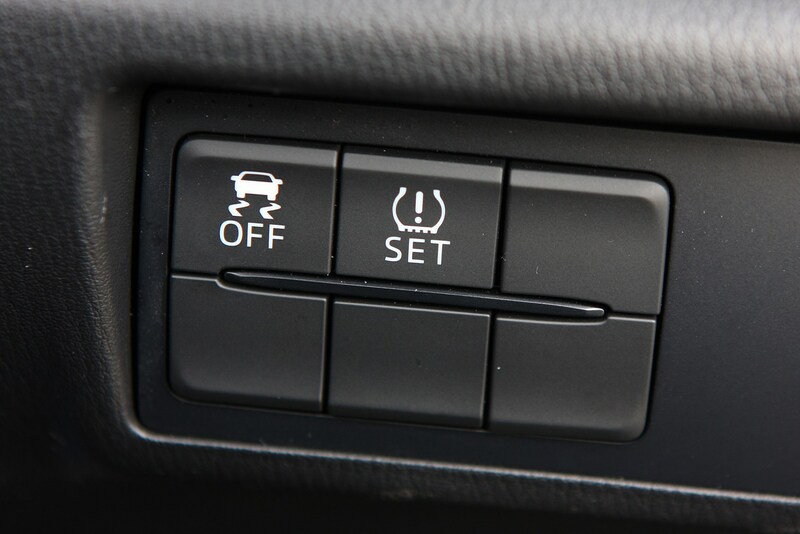 The driving position is great unless you’re tall, because the seat doesn’t go back very far and the steering wheel adjusts for height but not reach. 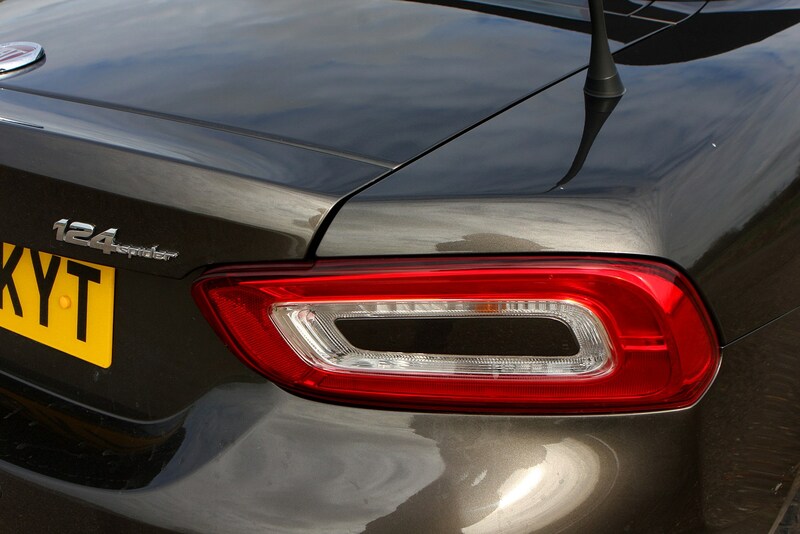 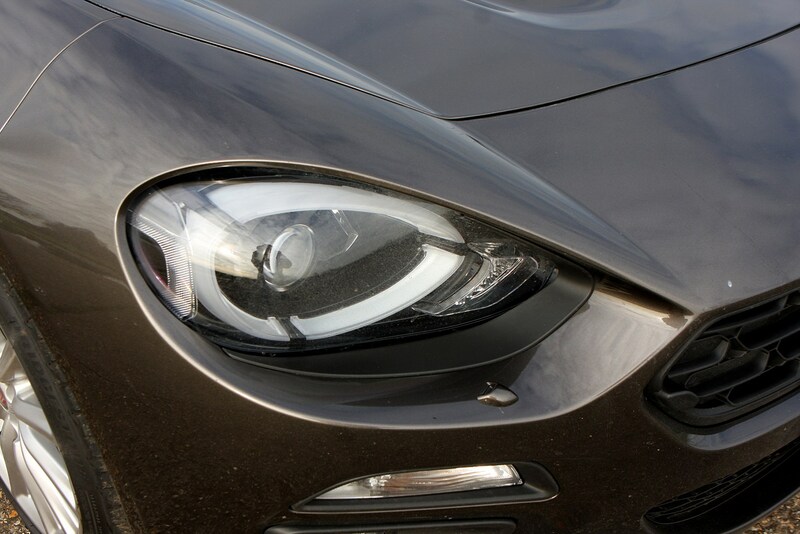 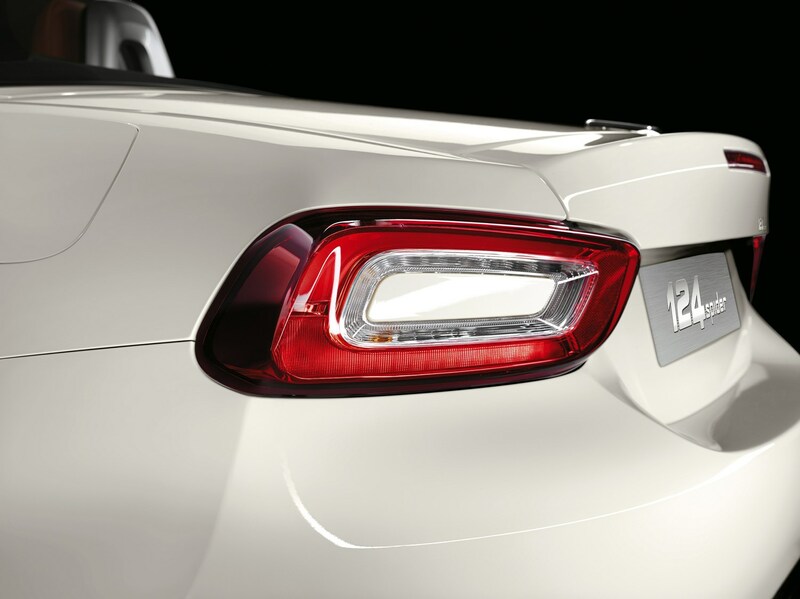 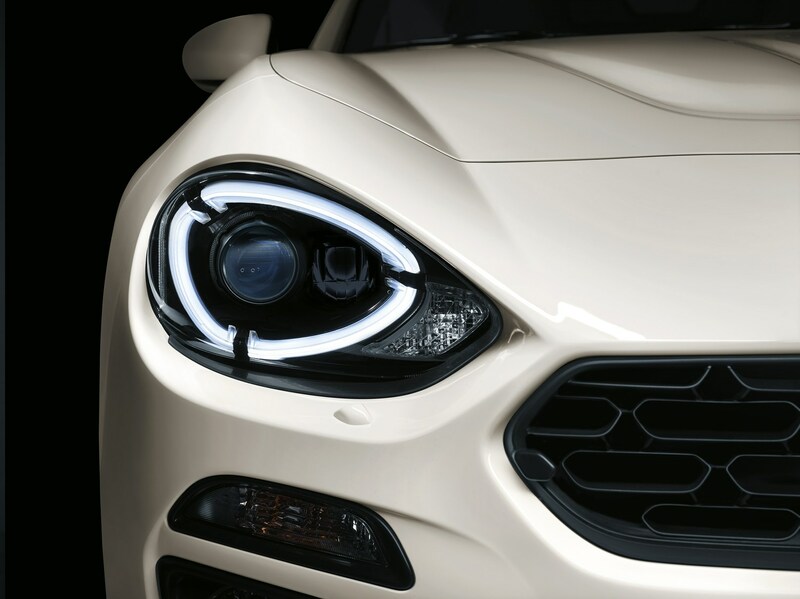 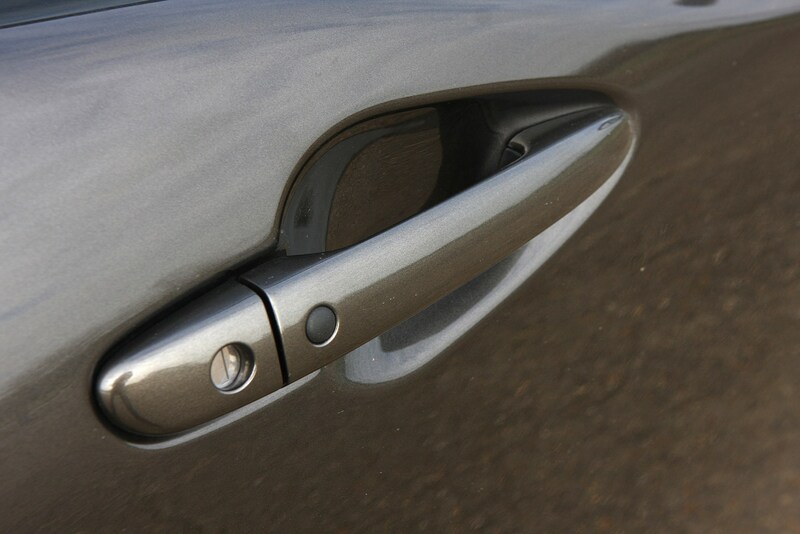 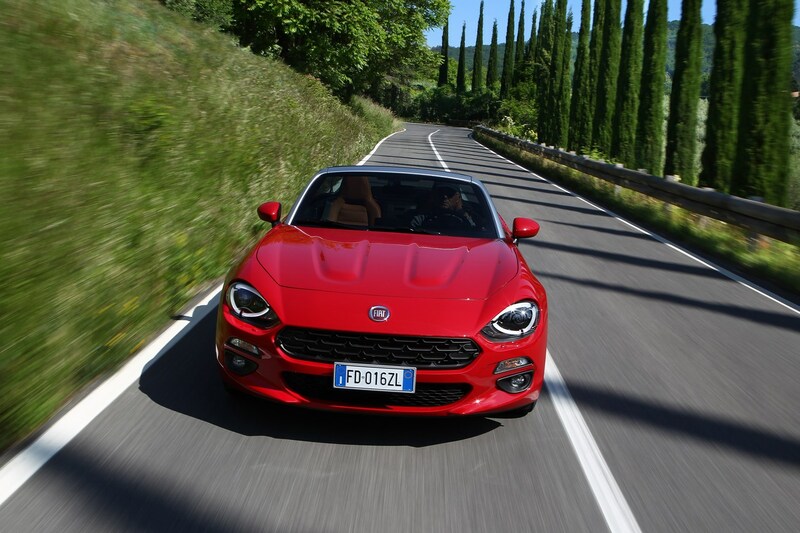 What differentiates the Fiat from the Mazda is a finer grade of materials, with softer-touch plastics on the dashboard and doors. 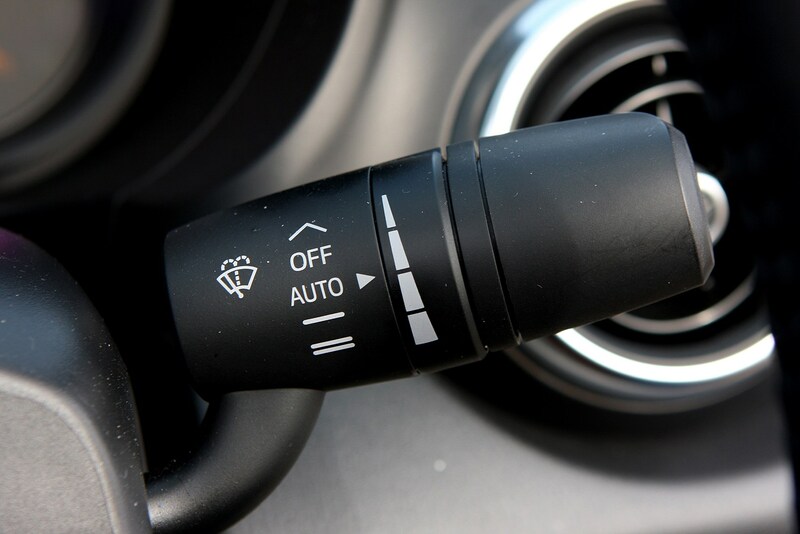 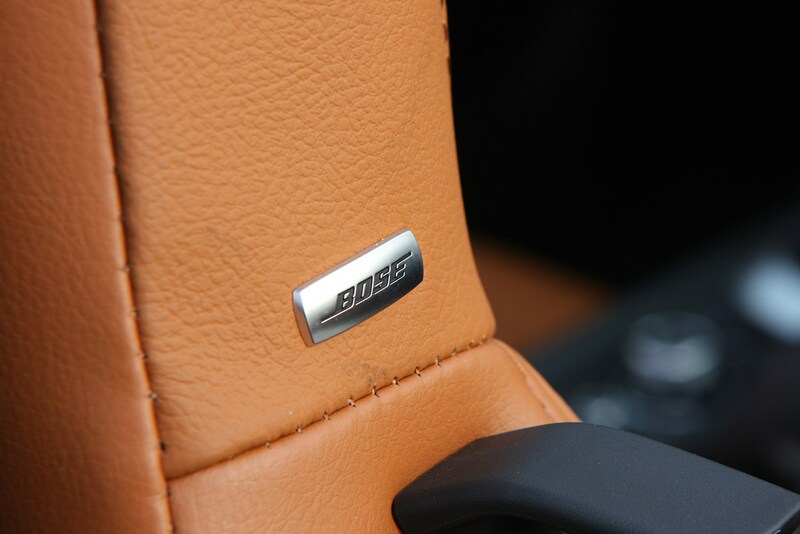 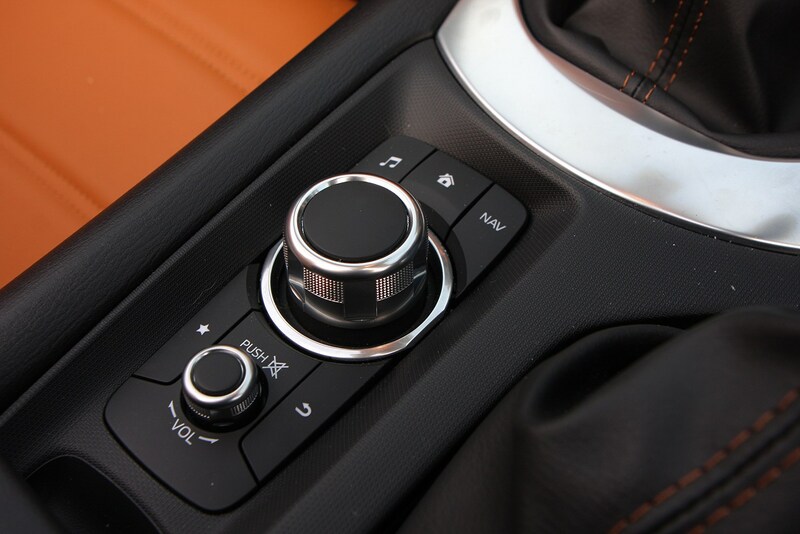 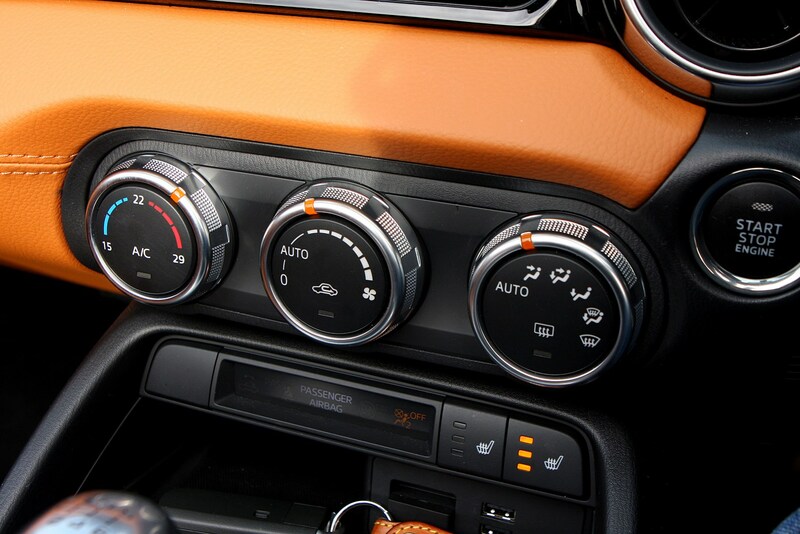 You also get a leather gearknob and wheel as standard. 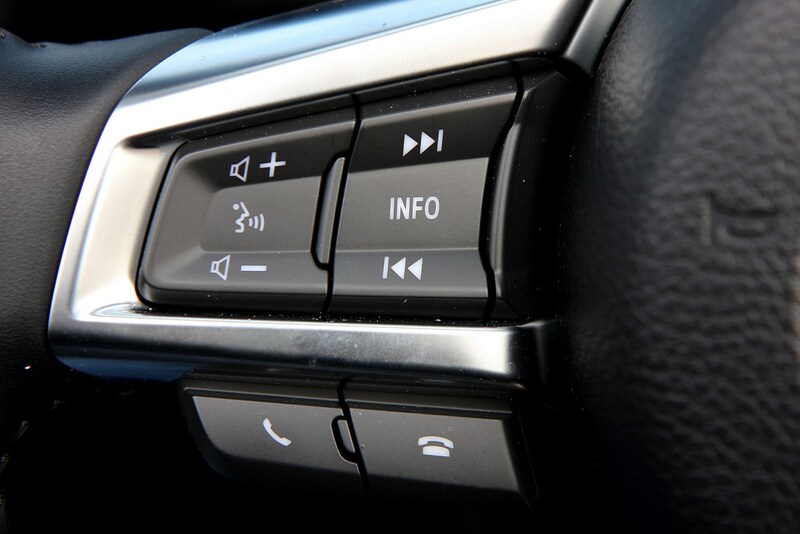 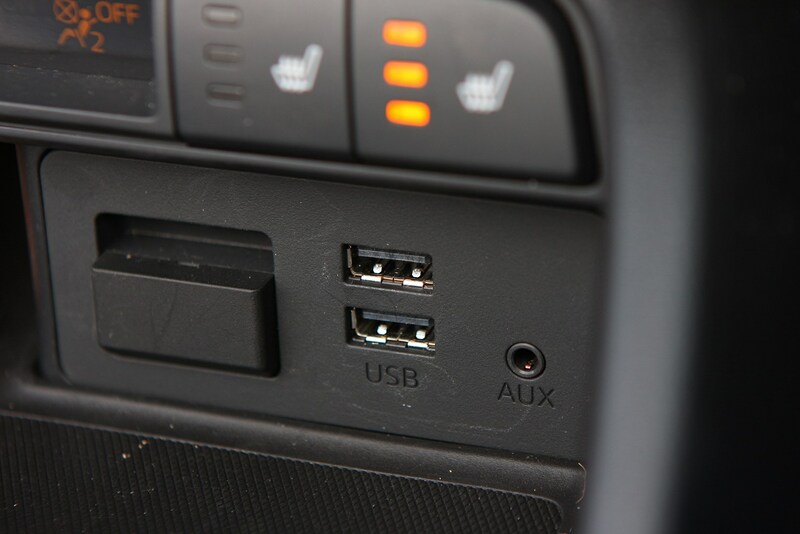 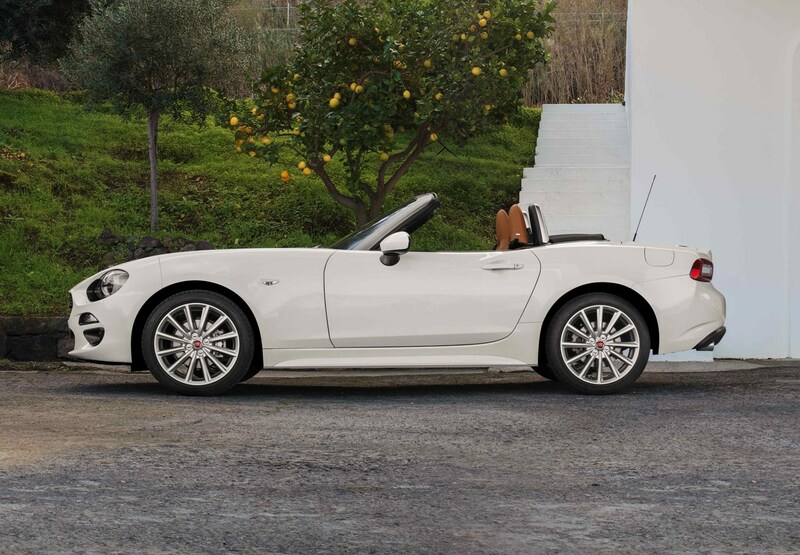 The media system is straight out of the MX-5, which is a good thing, because it’s one of the best on the market thanks to its clear display and easy-to-use control wheel. 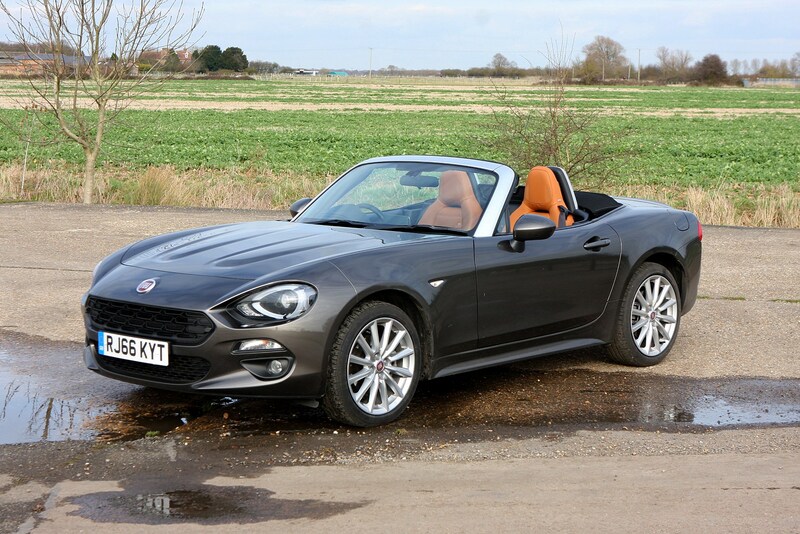 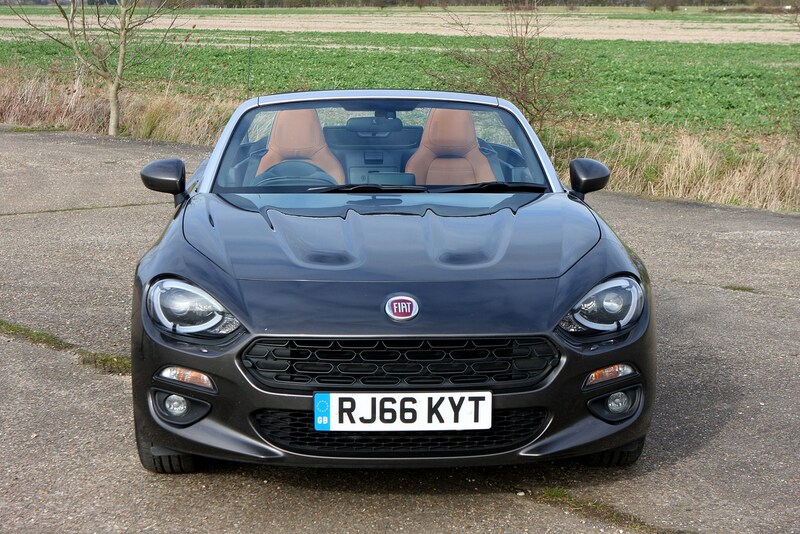 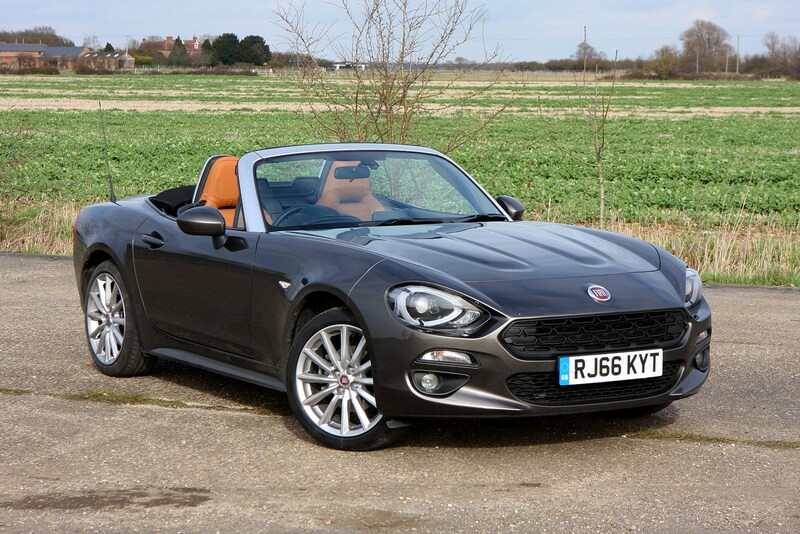 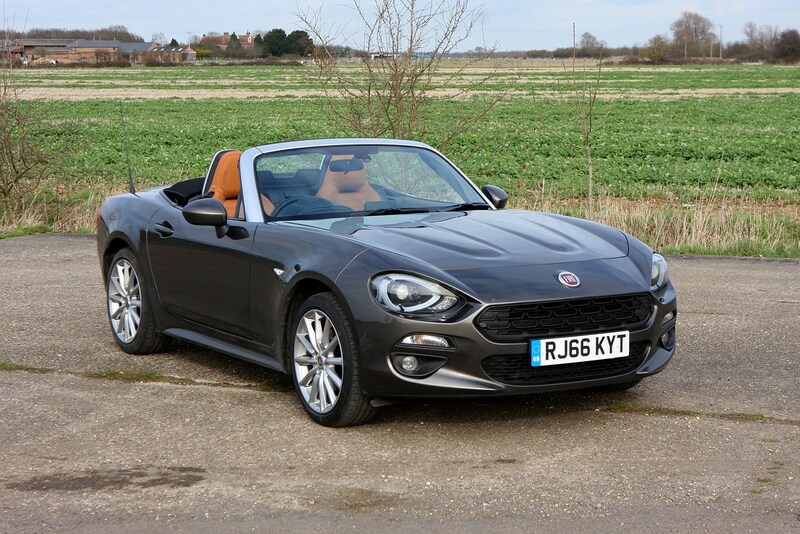 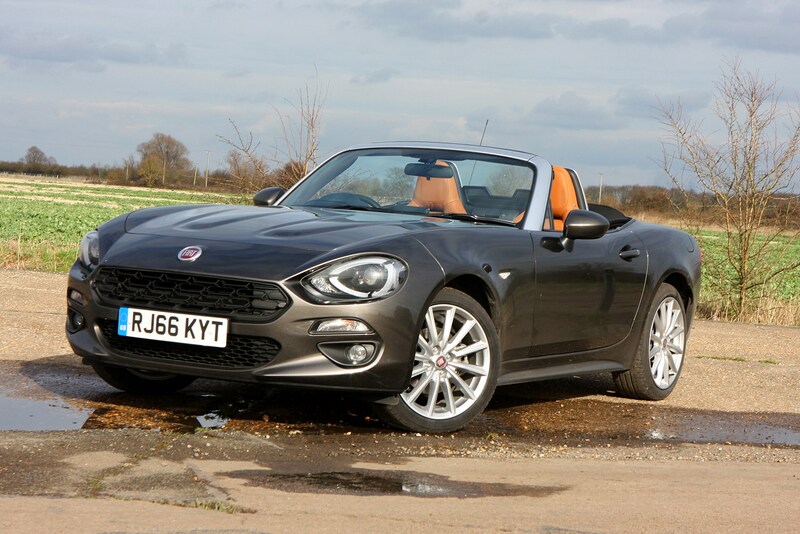 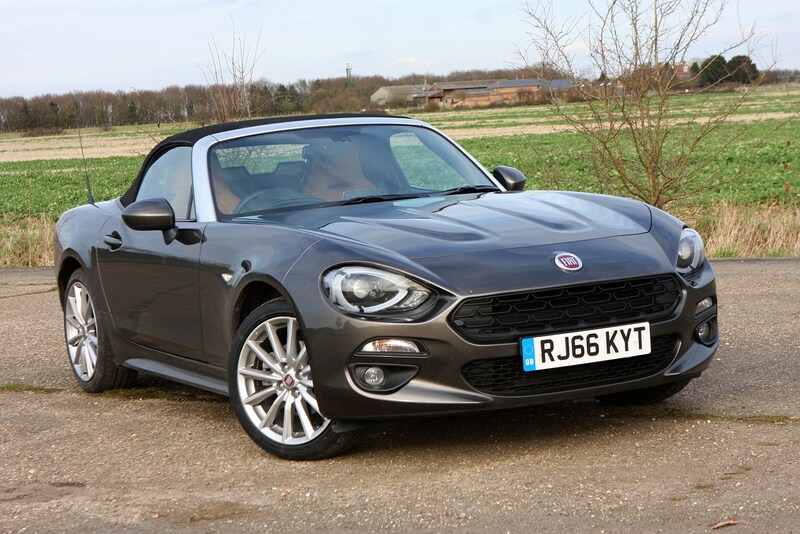 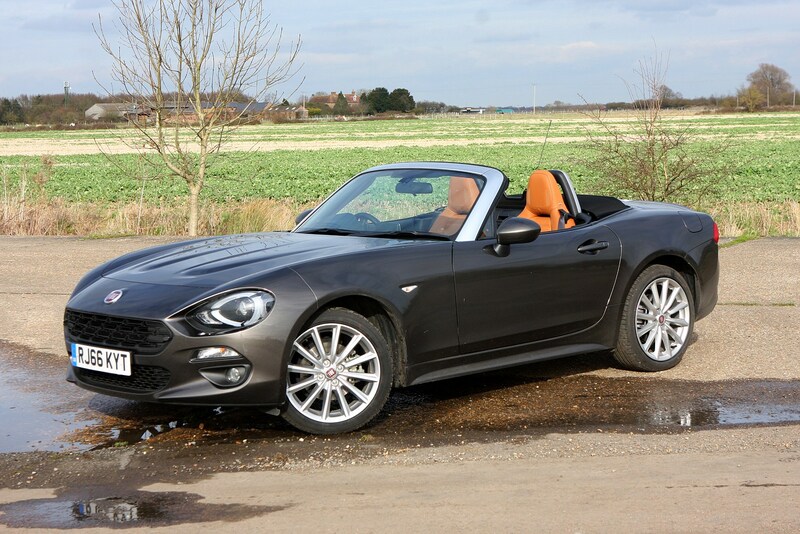 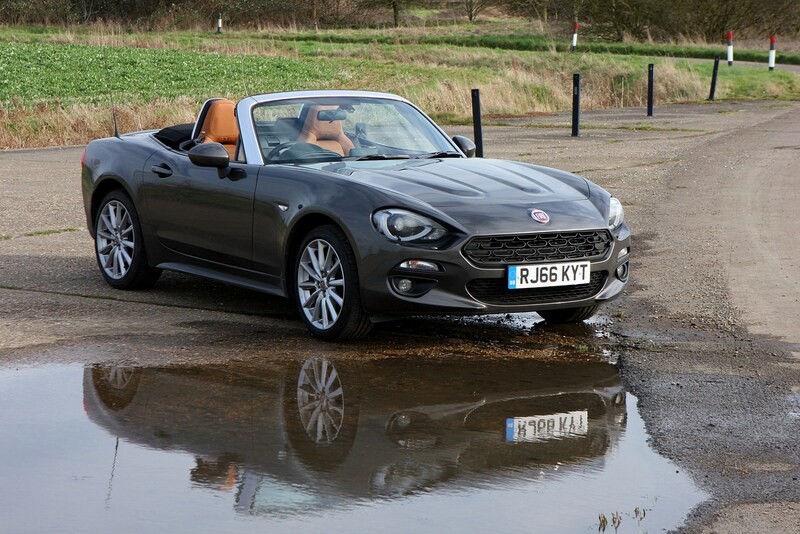 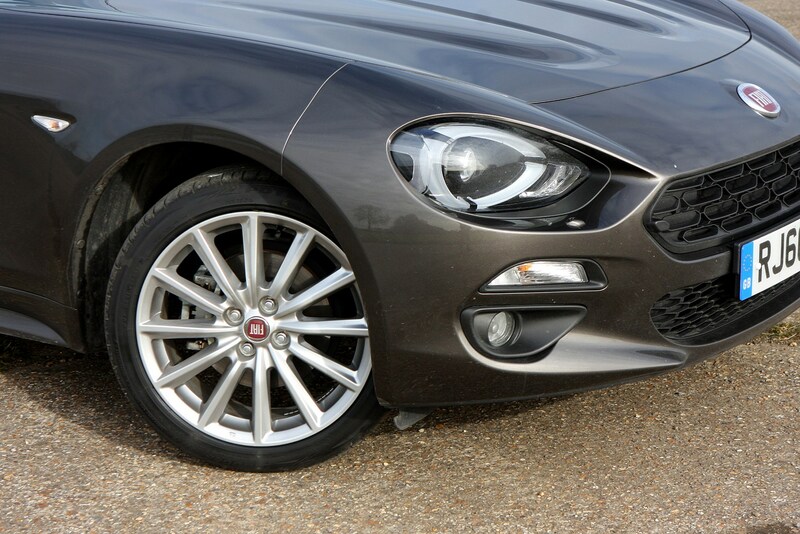 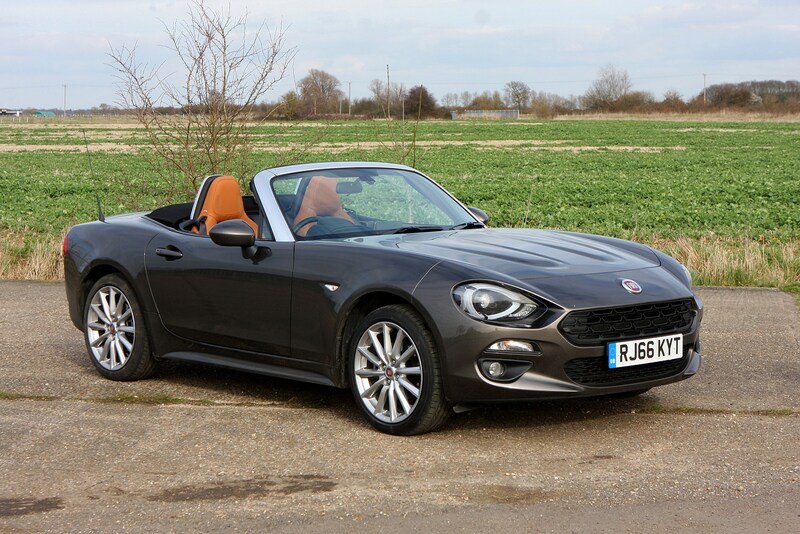 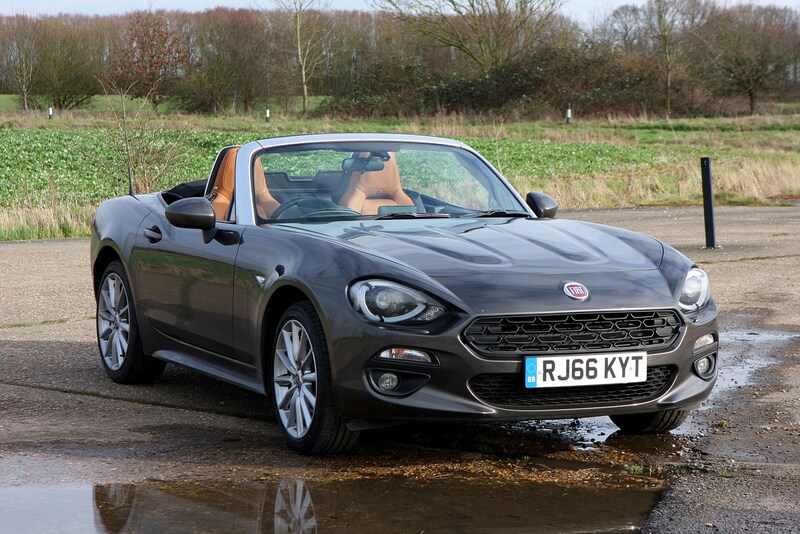 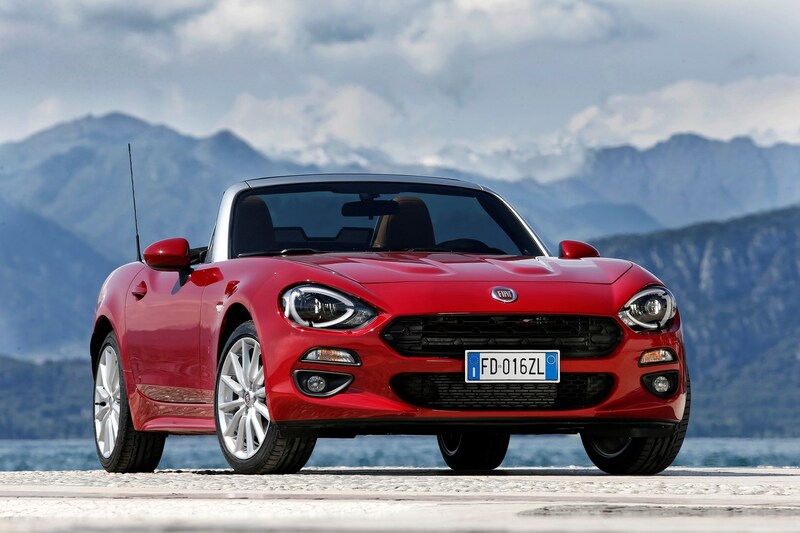 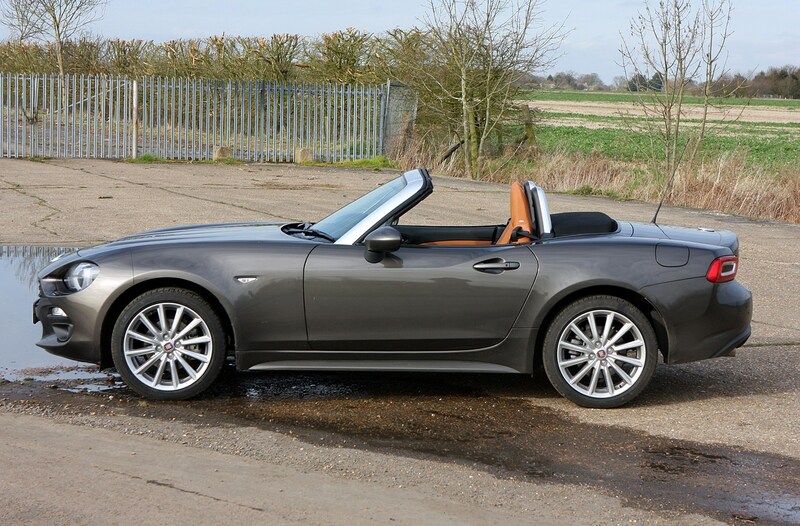 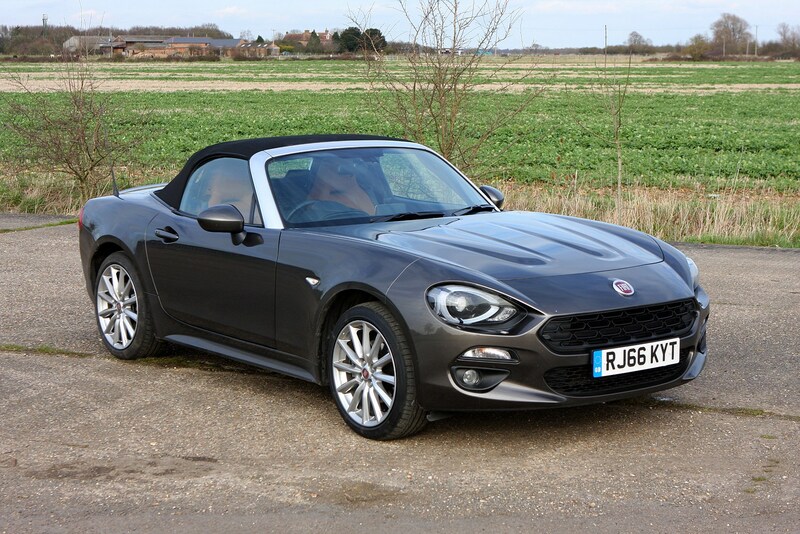 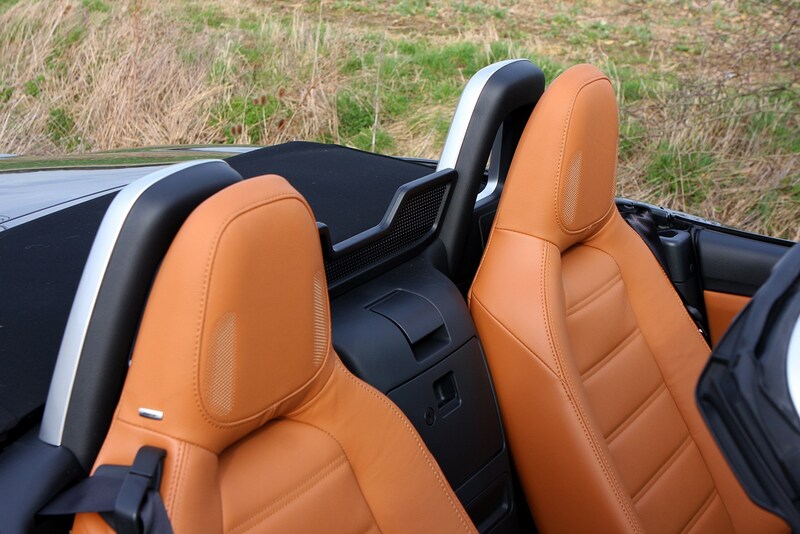 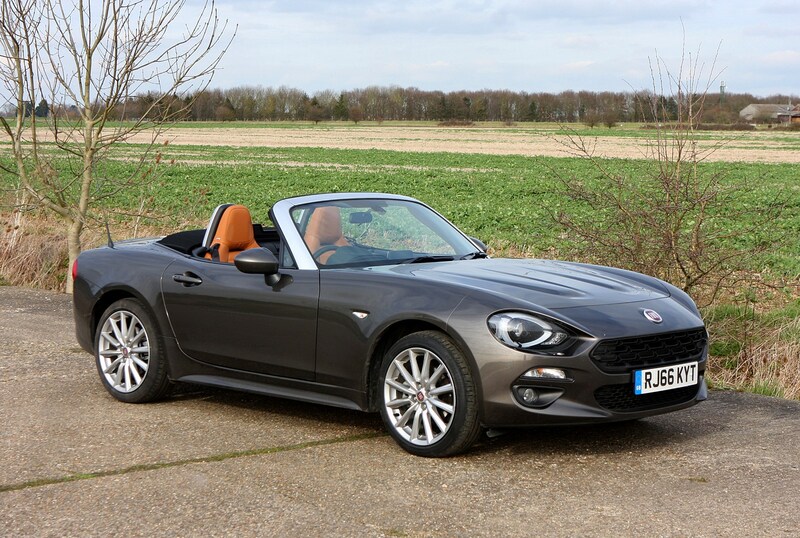 Ride comfort is spot-on in the Fiat 124 Spider if you want your roadster to have a more relaxed, continent-crossing feel. 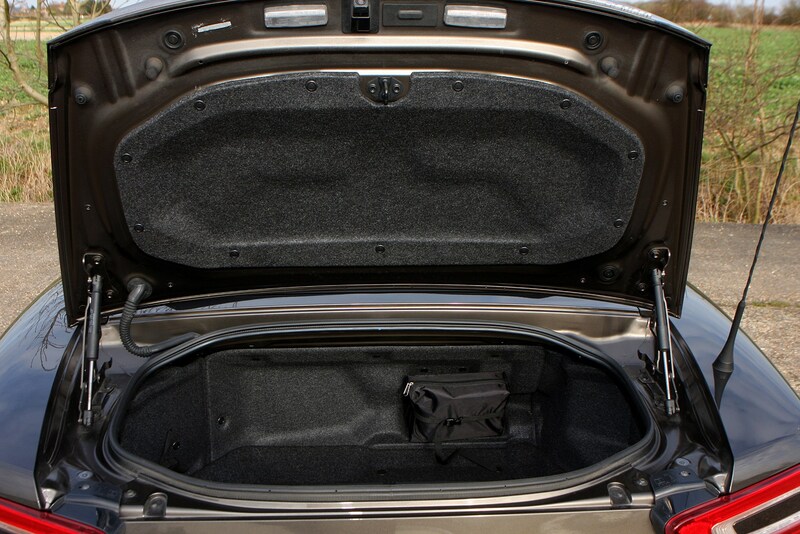 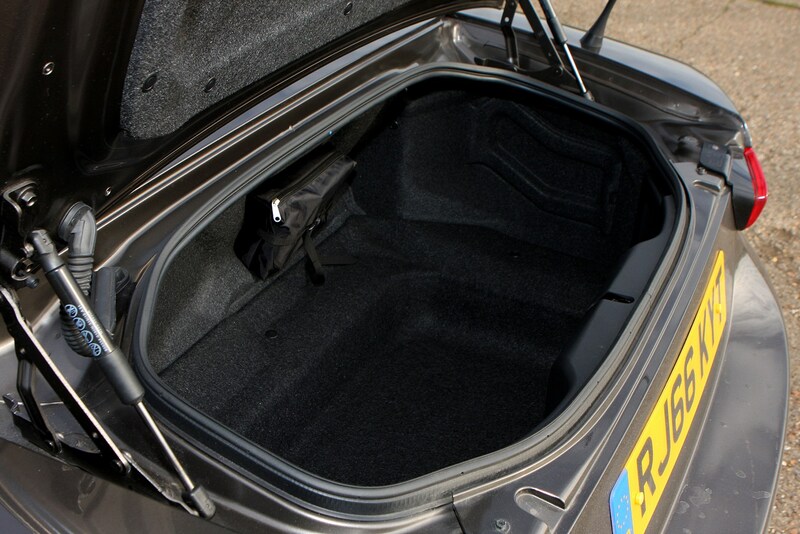 It’s supple and compliant, soaking up bumps well and isolating them from the cabin. 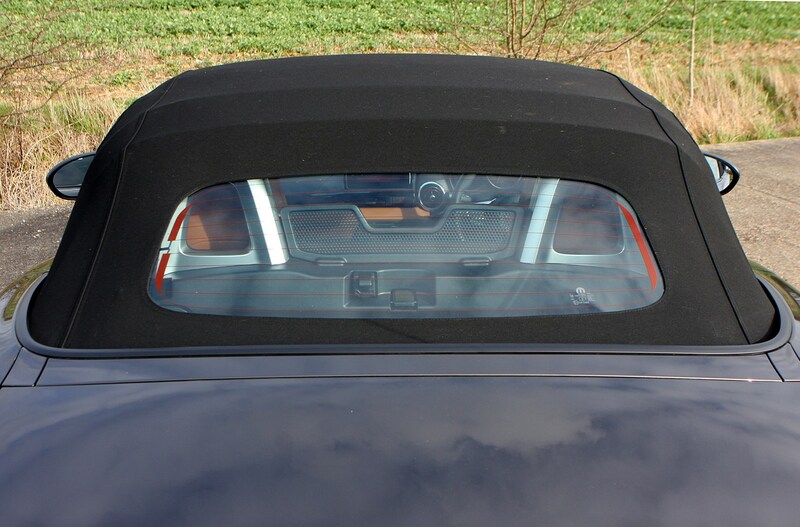 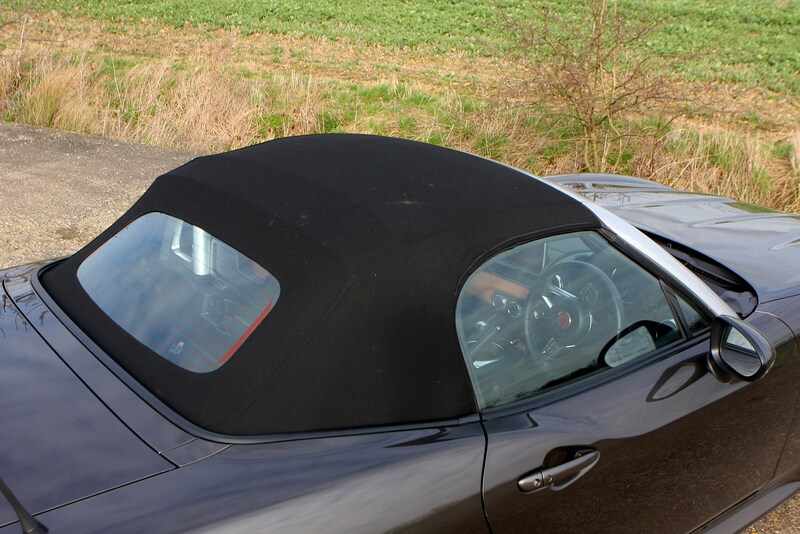 Refinement with the roof up or down is impressive, although taller occupants will have their hair rearranged by wind spilling over the low screen. 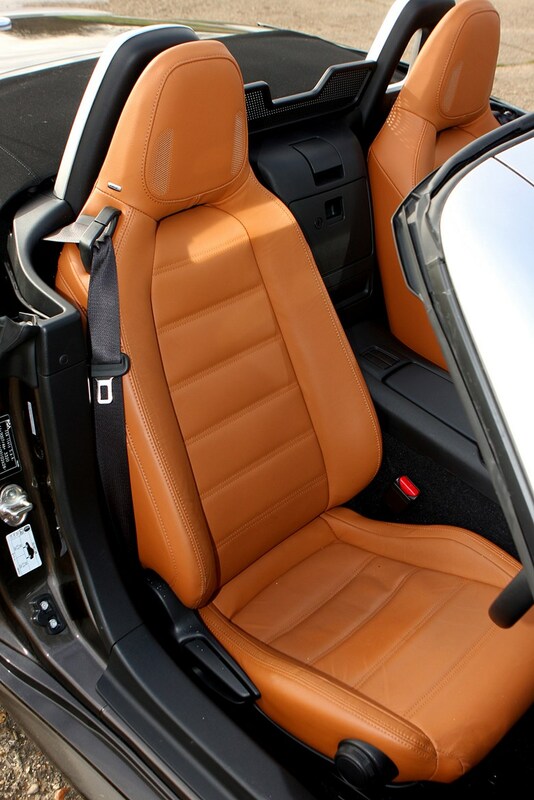 Higher trims come with soft leather that can be picked in a retro tobacco brown colour, which both looks and feels very nice indeed. 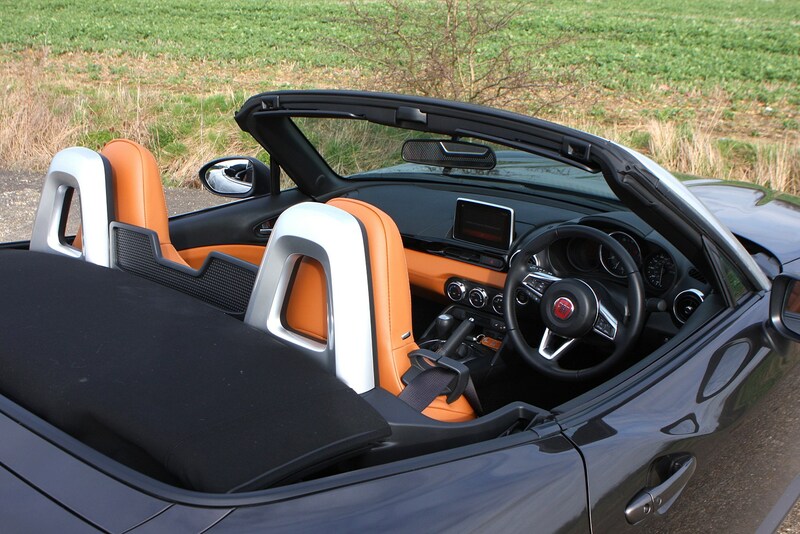 The seats themselves are a good shape too, incorporating a stereo speaker in more expensive grades, and offering a good level of support.